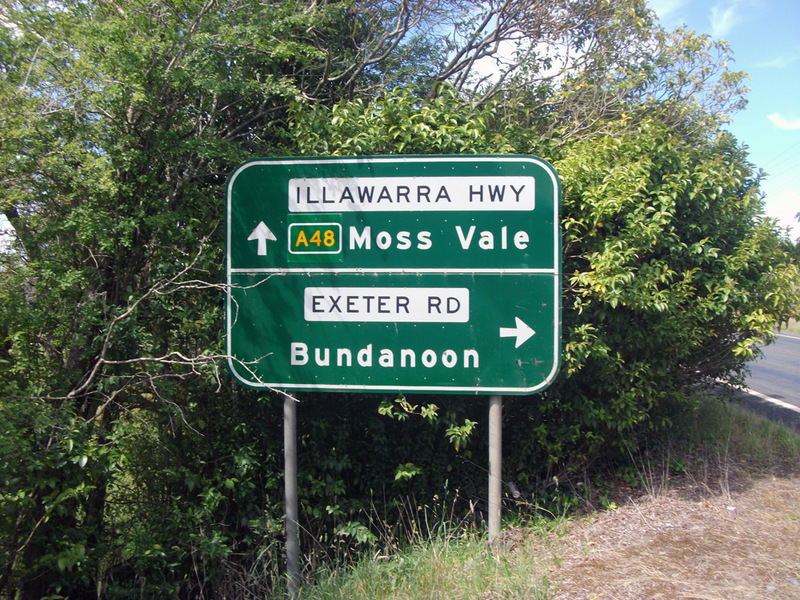 RD sign westbound on Illawarra Highway after the junction with Jamberoo Mountain Road, 3km east of Robertson. Source: Dean Pryke, October 2013. 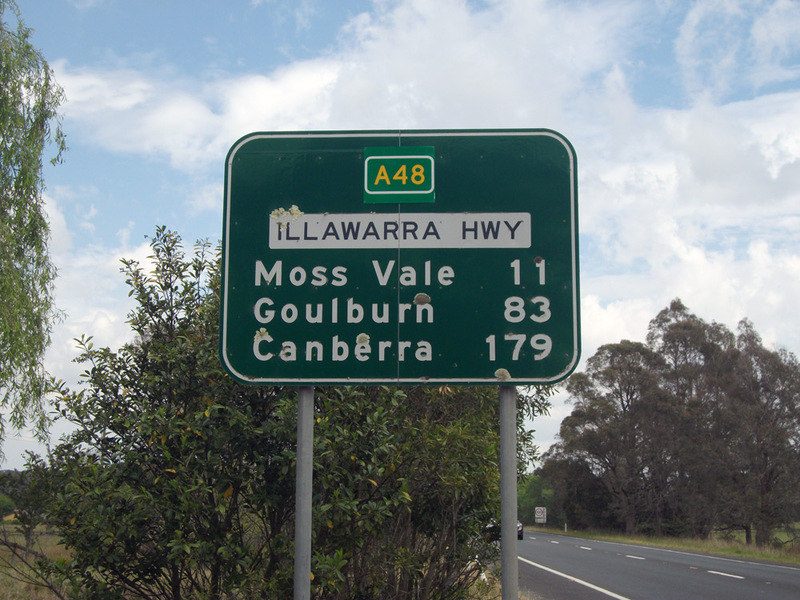 Route A48 is an east-west link between the Hume Highway (M31) and Princes Highway (A1) through the New South Wales Southern Highlands. 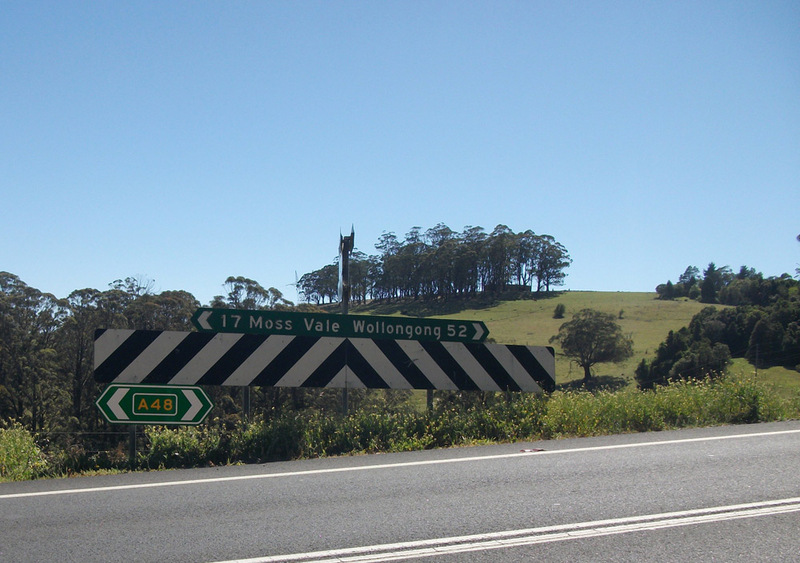 Its most well-known feature is Macquarie Pass, opened in 1898, which is a narrow, steep and winding road ascending the Illawarra Escarpment. 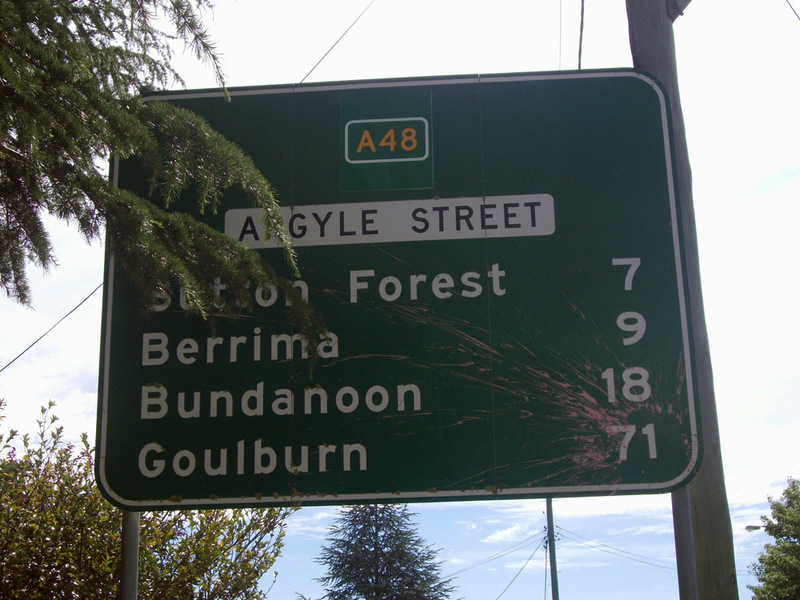 The first exposed A48 route markers were spotted in 2006 at Burrawang and Sutton Forest. 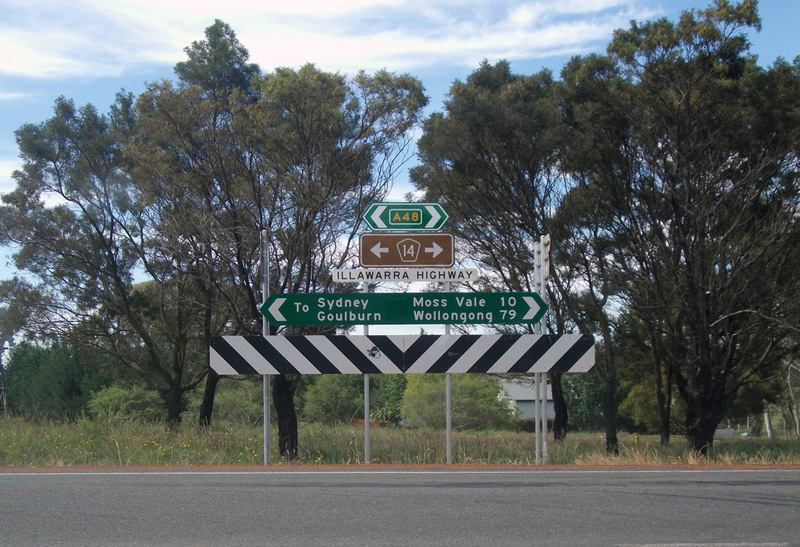 As at December 2013, A48 is mostly signed with coverplates and topknots, with some alpha-numeric ready signage scattered at various locations along the route. 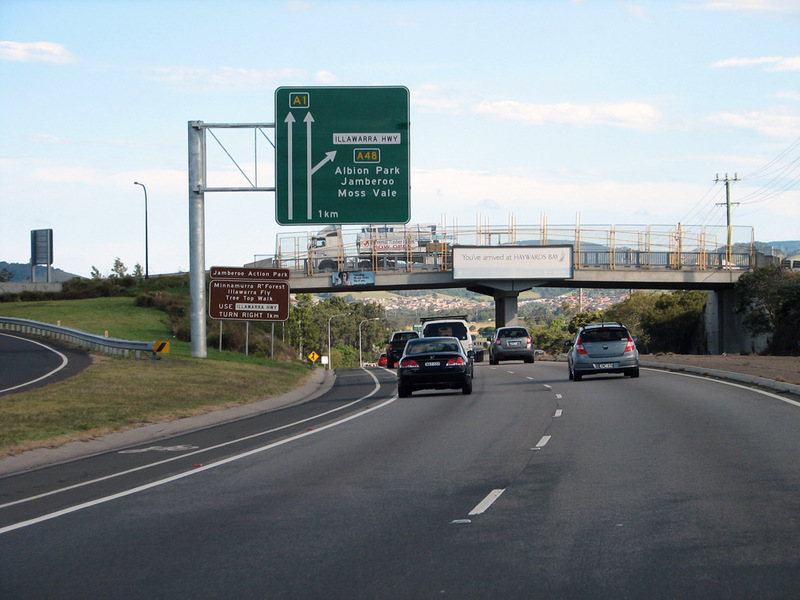 AD signs southbound on Princes Motorway approaching the junction with Illawarra Highway, Albion Park Rail. These A48 route markers were uncovered when M1/A1 was uncovered in June 2013. 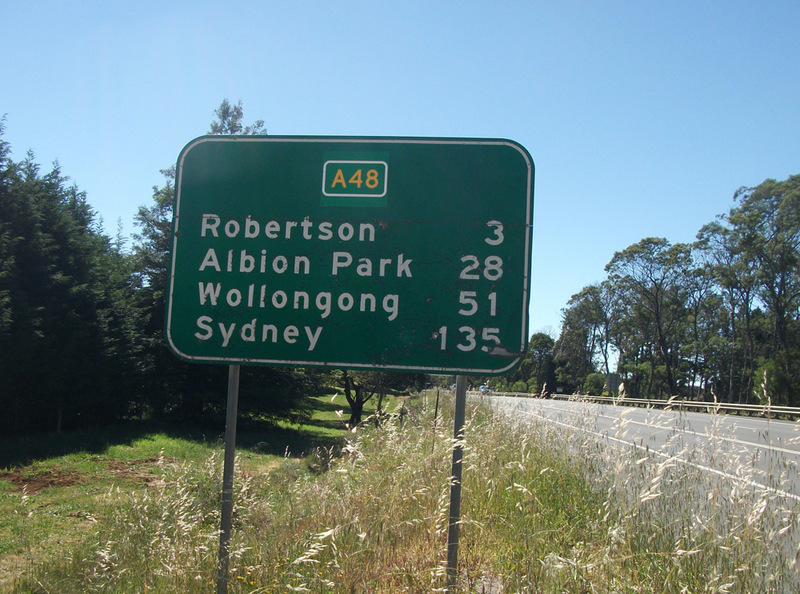 Southbound A48 ID signs at the junction of Princes Motorway, Princes Highway & Illawarra Highway, Albion Park Rail. 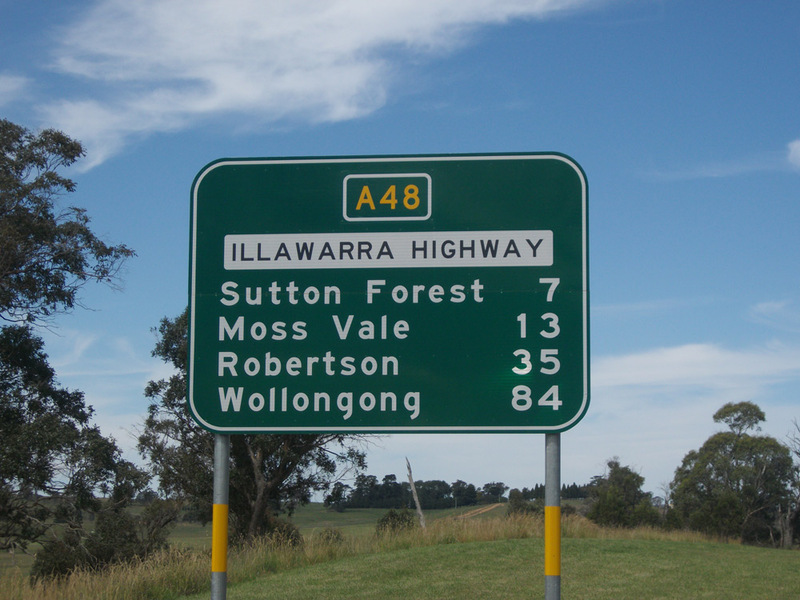 These A48 route markers signs were uncovered in October 2013, several months after the previous signs. Photos taken: Dean Pryke, November 2013. 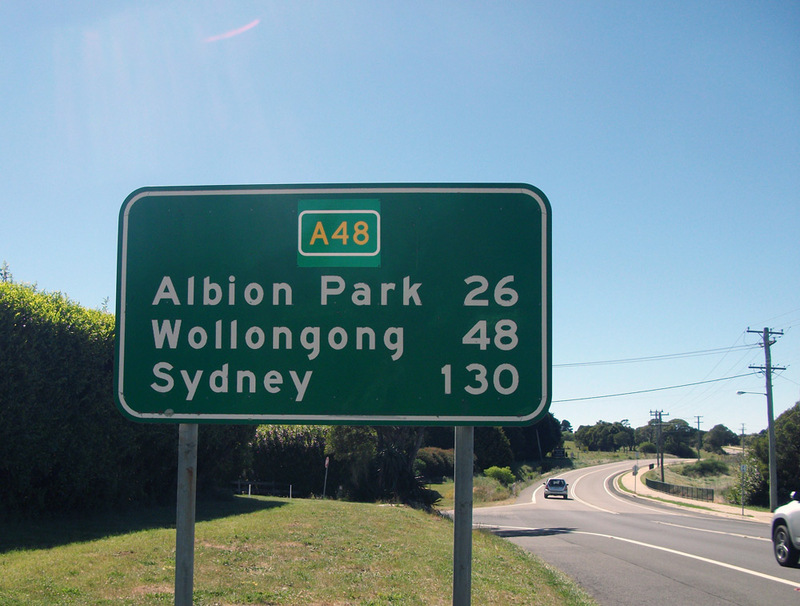 AD sign northbound on Princes Highway approaching the junction with Illawarra Highway, Albion Park Rail. Photo taken: Dean Pryke, November 2013. 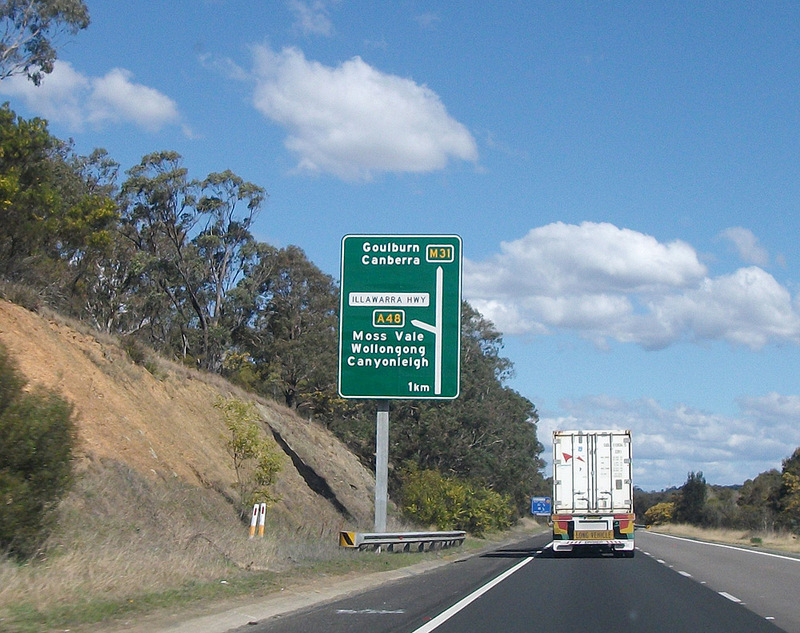 AD sign northbound on Princes Motorway approaching the junction with Princes Motorway/Princes Highway, Albion Park Rail. 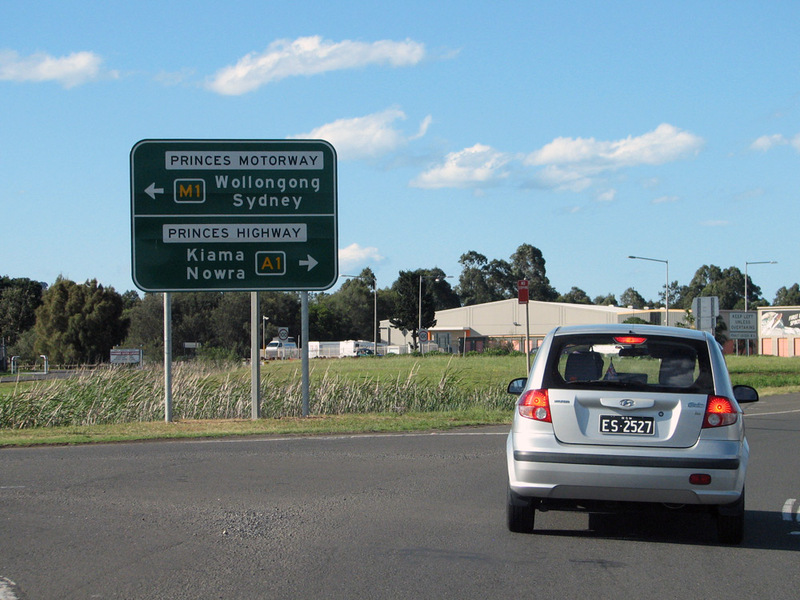 RD sign southbound on Illawarra Highway after the junction with Princes Highway/Princes Motorway at Albion Park Rail. 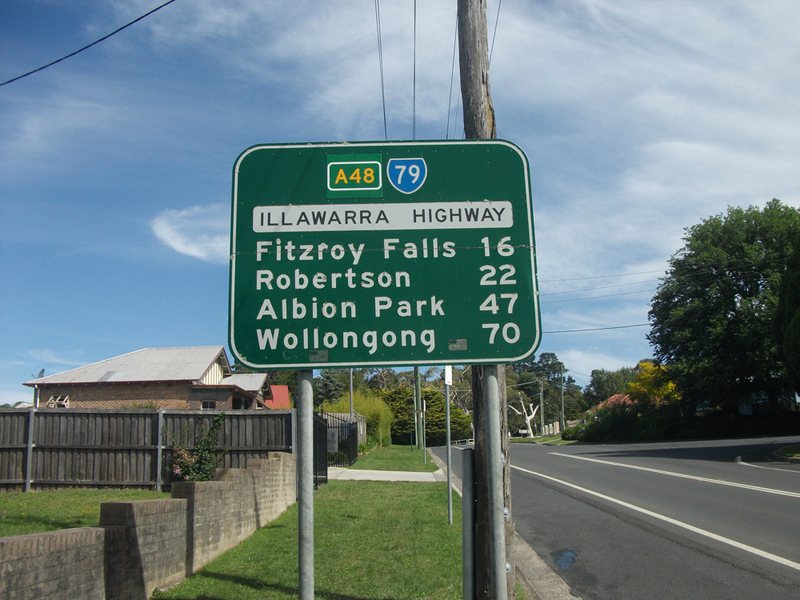 Coverplated RD sign northbound on Illawarra Highway after the junction with Taylor Road, Albaion Park. 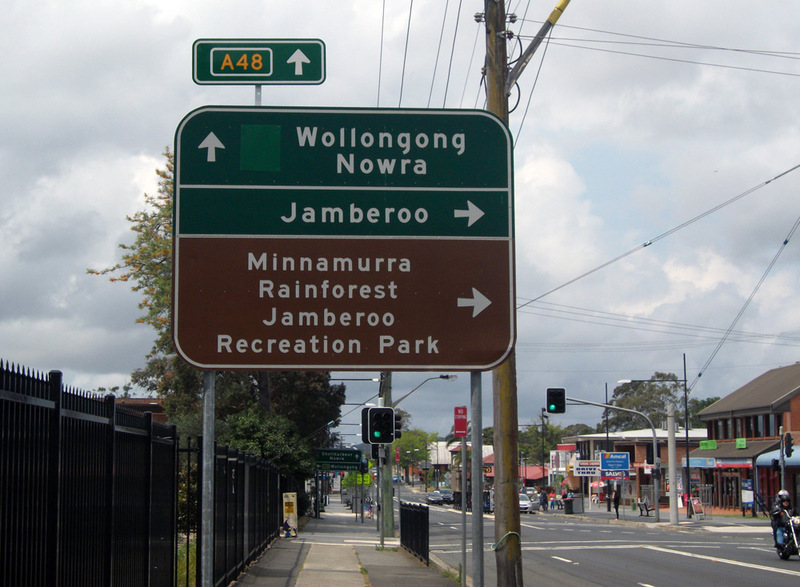 Coverplated ID sign with an A48 topknot at the junction of Tongarra Road & Terry Street, Albion Park. 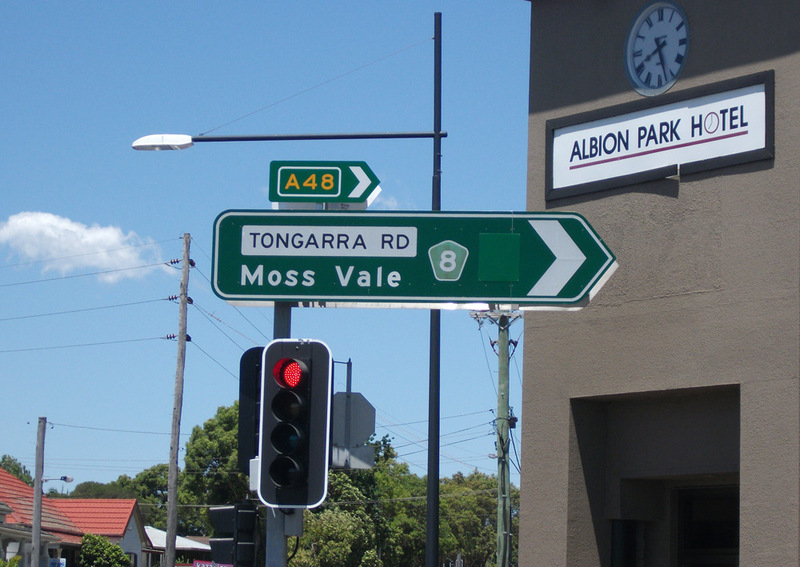 Coverplated AD sign northbound on Terry Street approaching the junction with Tongarra Road, Albion Park. Note the remnant SR157 shields. 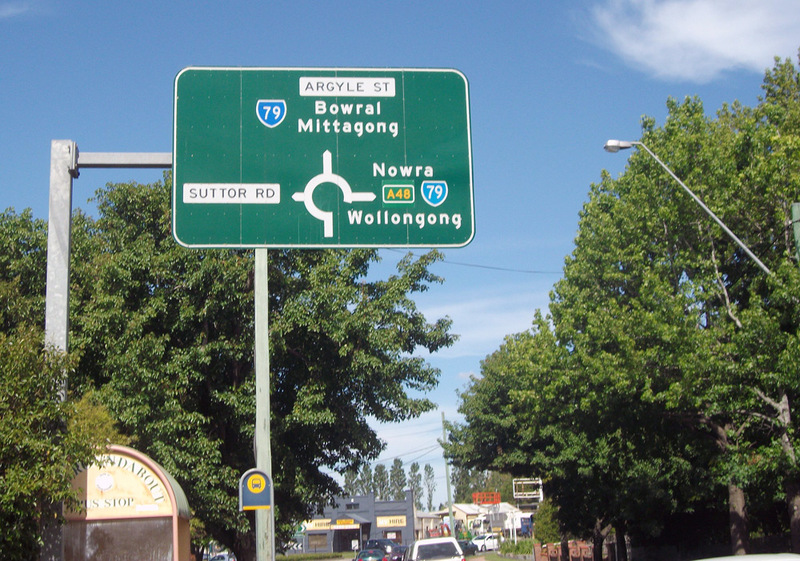 Coverplated AD sign eastbound on Illawarra Highway (Tongarra Road) approaching the junction with Terry Street, Albion Park. Source: Dean Pryke, October 2013. 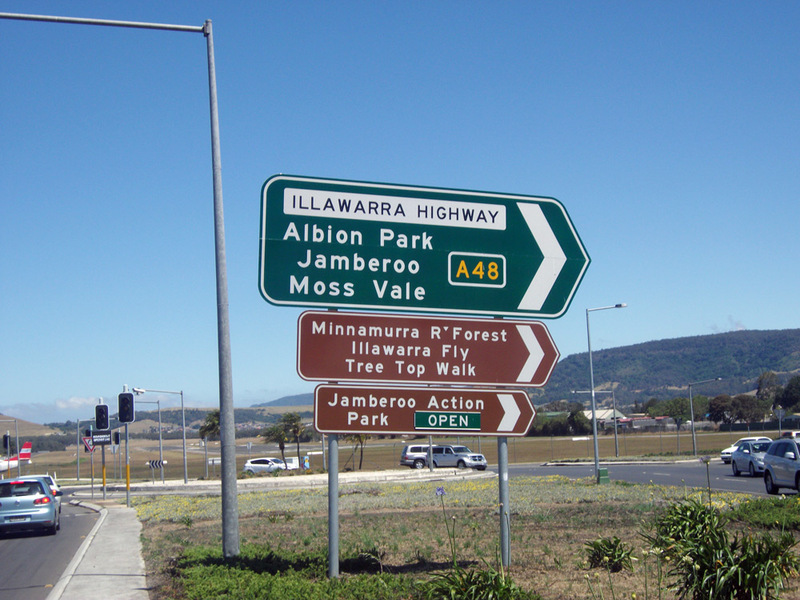 AD sign eastbound on Illawarra Highway (Tongarra Road) approaching the junction with Russell Street, Albion Park. Note the use of the topknot rather than a squeezed coverplate. 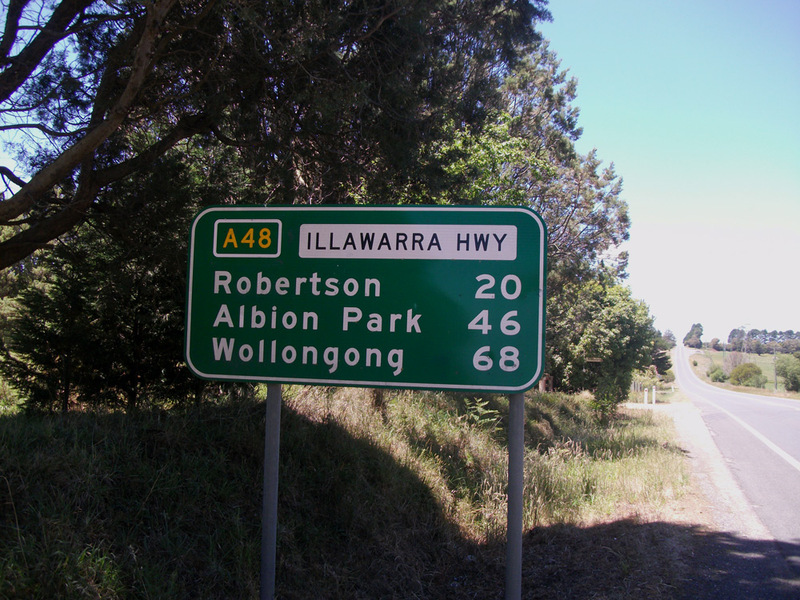 RD sign westbound on Illawarra Highway (Tongarra Road) after the junction with Russell Street, Albion Park. 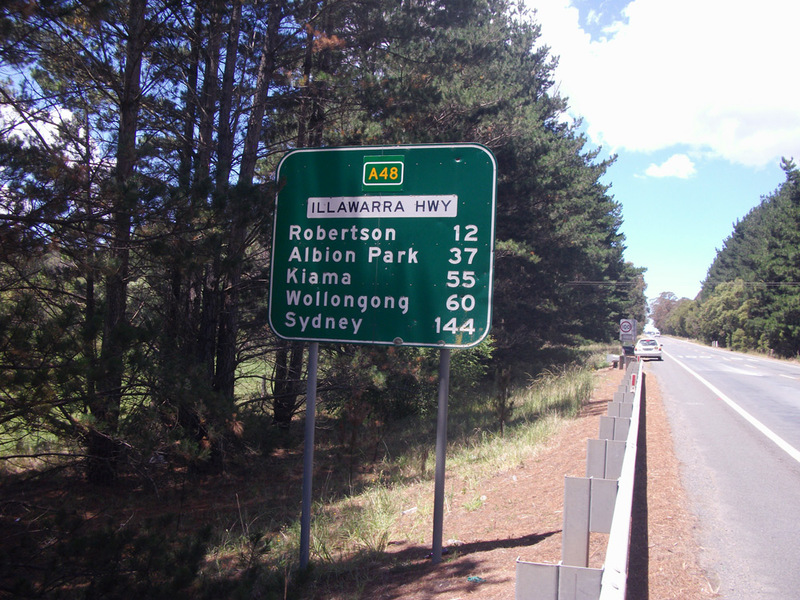 RD sign eastbound on Illawarra Highway after the junction with Jamberoo Mountain Road, 3km east of Robertson. 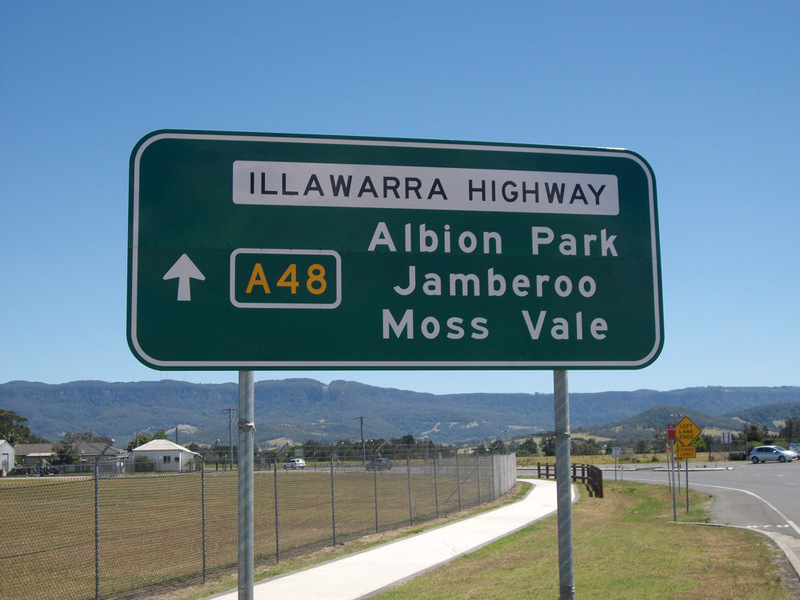 AD sign westbound on Illawarra Highway approaching the junction with Jamberoo Mountain Road, 3km east of Robertson. Note the use of a topknot - probably unnecessary as the State Route 80 shield could have been coverplated as well. 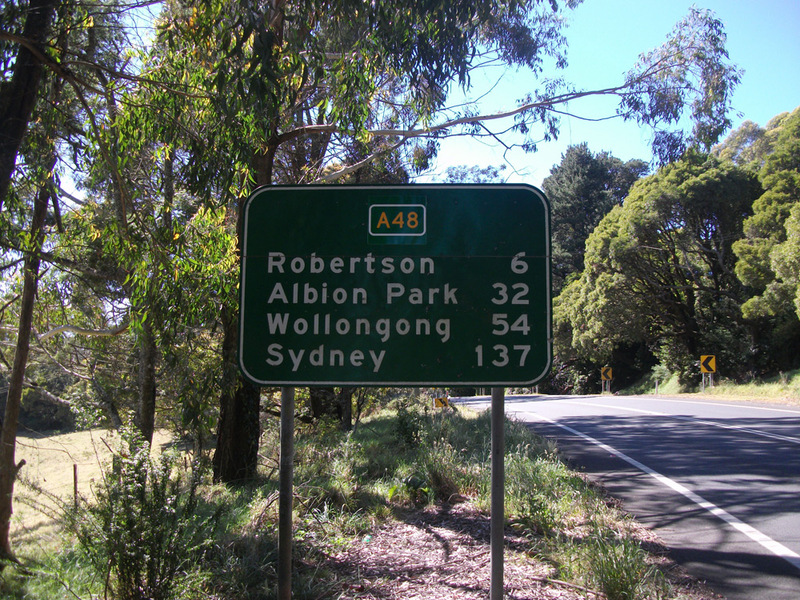 AD sign northbound on Jamberoo Mountain Road approaching the junction with Illawarra Highway, 3km east of Robertson. 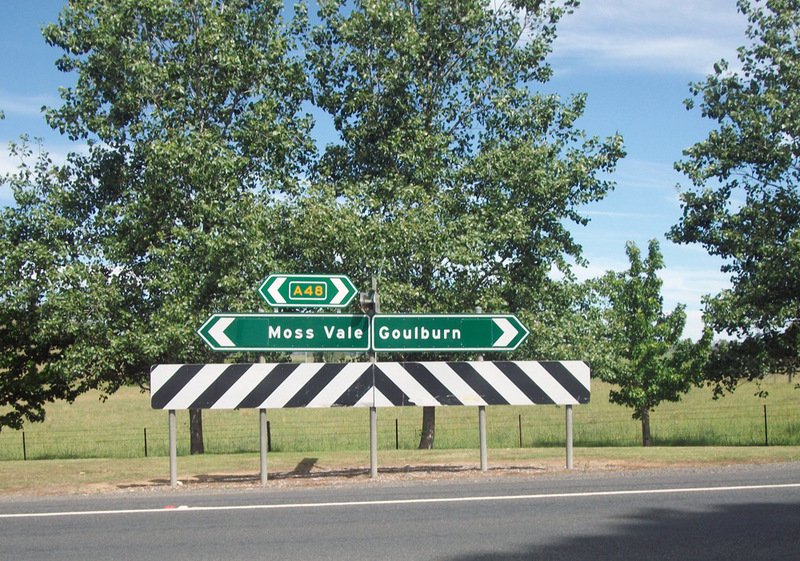 Note the dodgy fingerboard added to the AD sign - a common problem in regional NSW where RMS sign designers fail to consider the focal points of junctioning roads. Also note the absence of a State Route 80 shield - it was not well signposted during the years prior to its decommissioning. 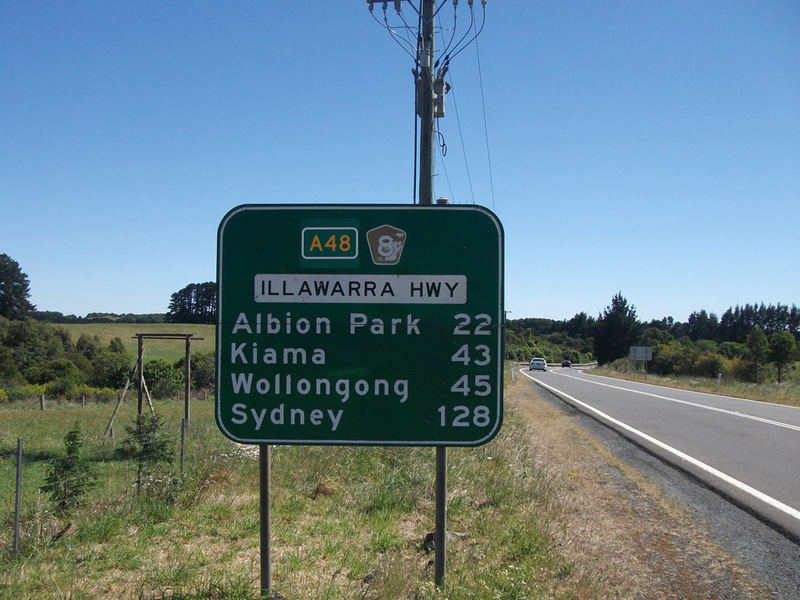 ID sign assembly at the junction of Illawarra Highway & Jamberoo Mountain Road, 3km east of Robertson. 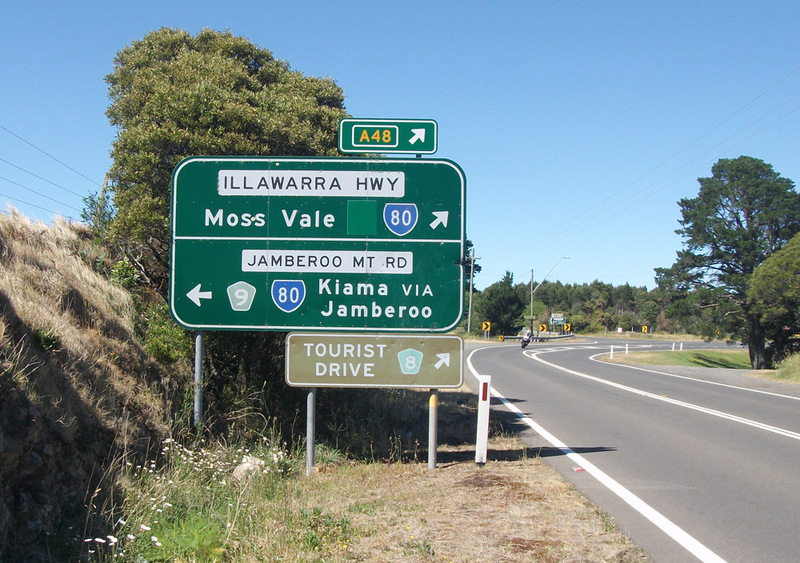 RD sign westbound on Illawarra Highway after the junction with Jamberoo Mountain Road, 3km east of Robertson. 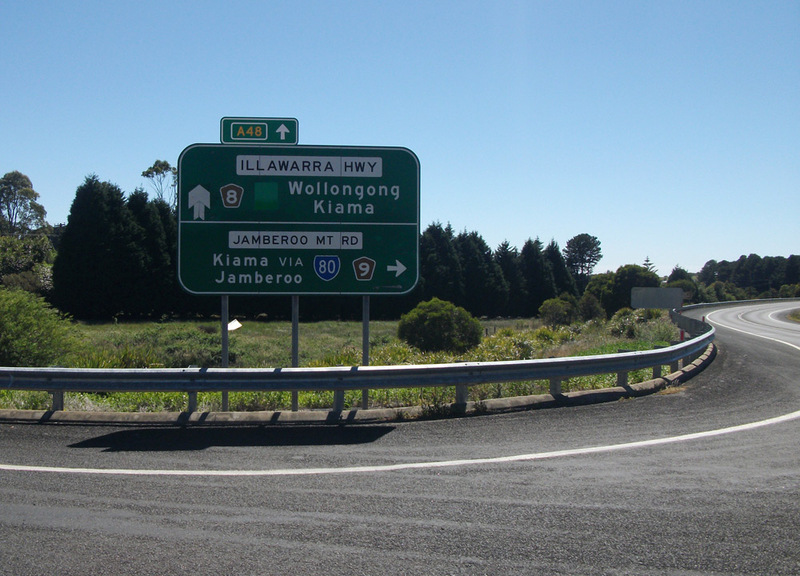 AD sign eastbound on Illawarra Highway approaching the junction with Jamberoo Mountain Road, 3km east of Robertson. 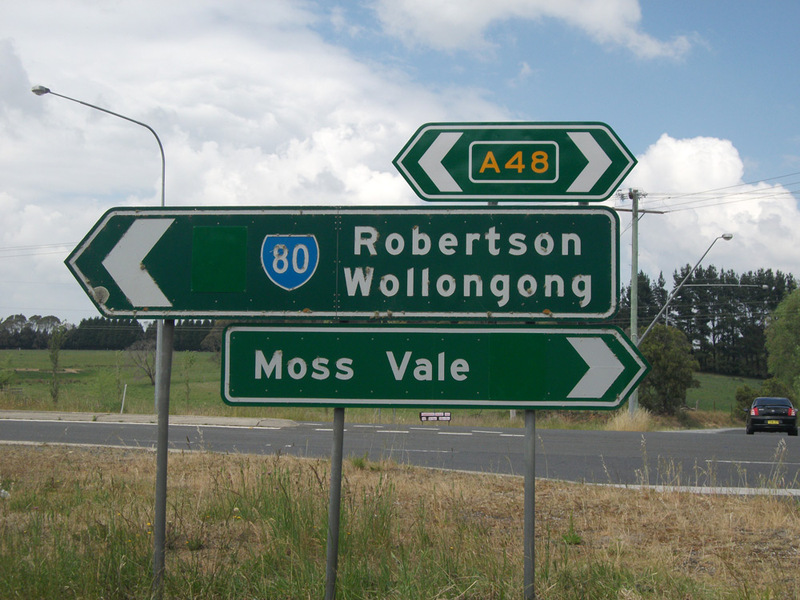 RD sign eastbound on Illawarra Highway on the eastern outskirts of Robertson. 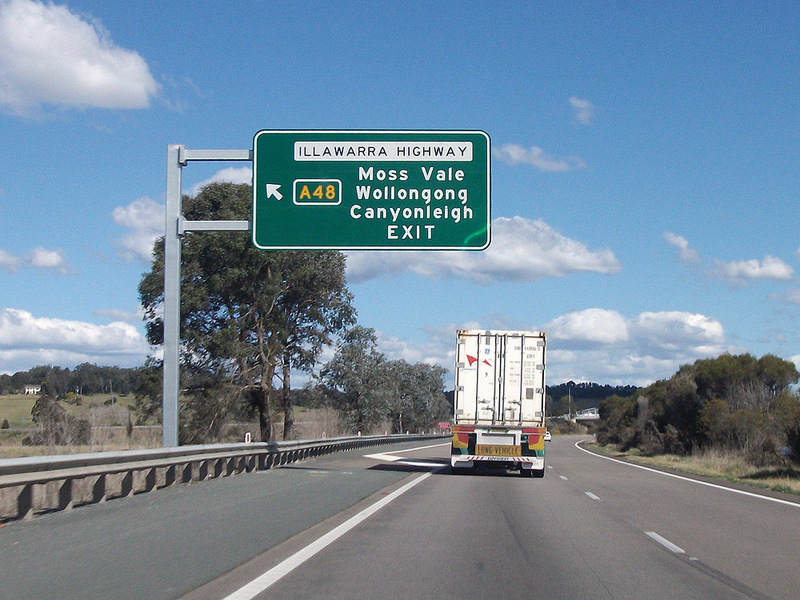 AD sign westbound on Illawarra Highway approaching the junction with Meryla Street, Robertson. 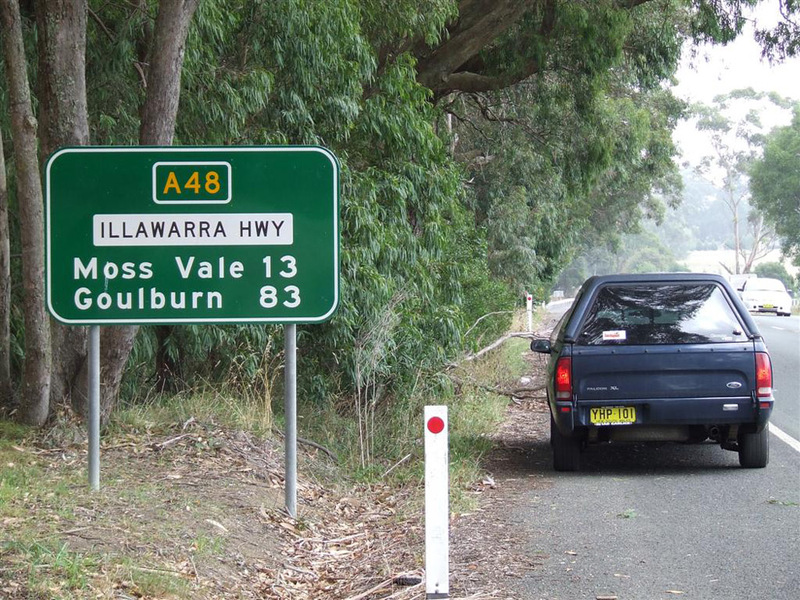 Prematurely uncovered A48 route marker on an ID sign at the junction of Illawarra Highway & Meryla Street, Robertson. Source: Dean Pryke, April 2010. 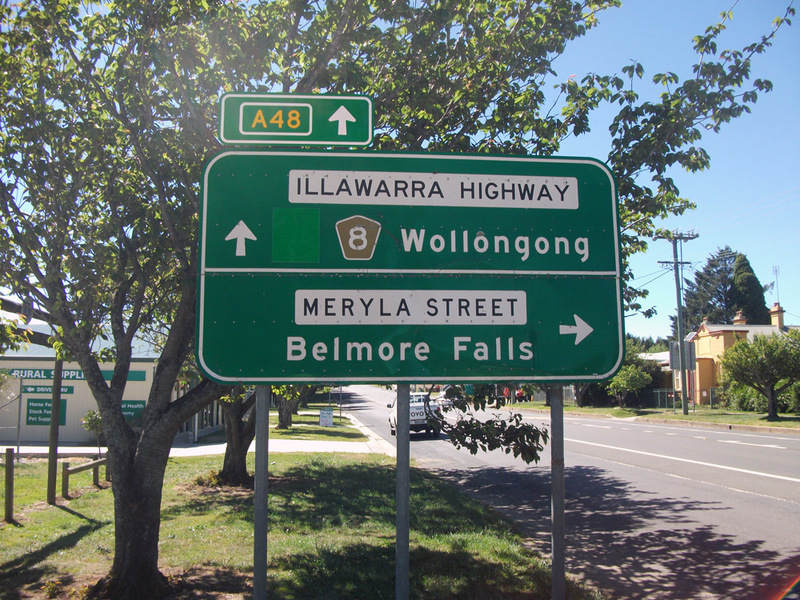 AD sign eastbound on Illawarra Highway approaching the junction with Meryla Street, Robertson. 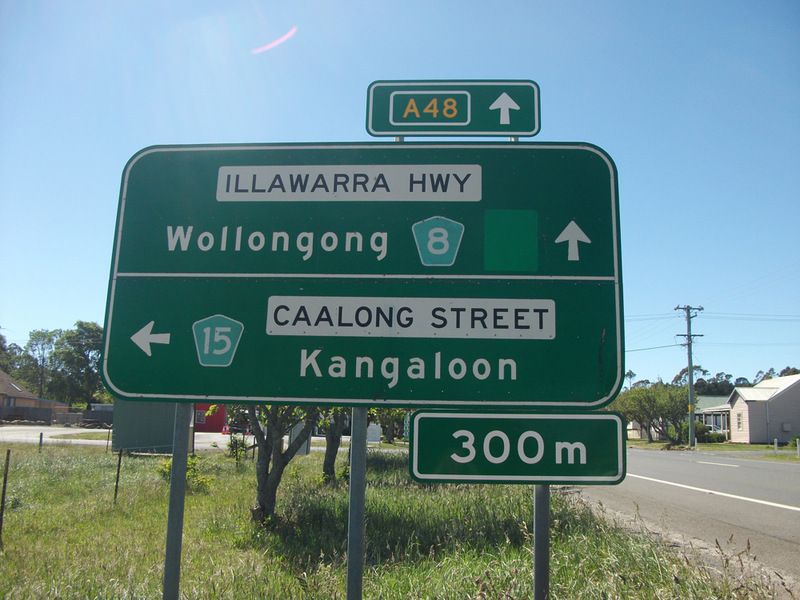 AD sign westbound on Illawarra Highway approaching the junction with Caalong Street, Robertson. 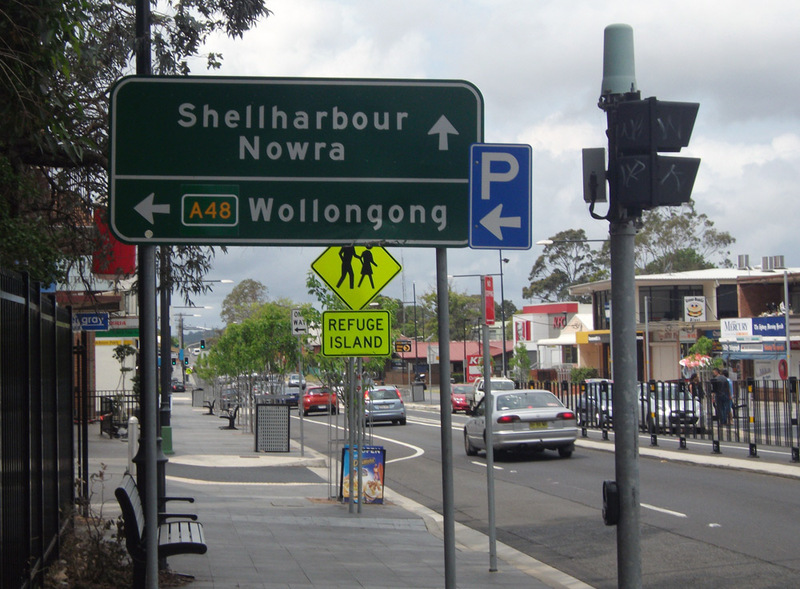 ID sign assembly at the junction of Illawarra Highway & Caalong Street, Robertson. 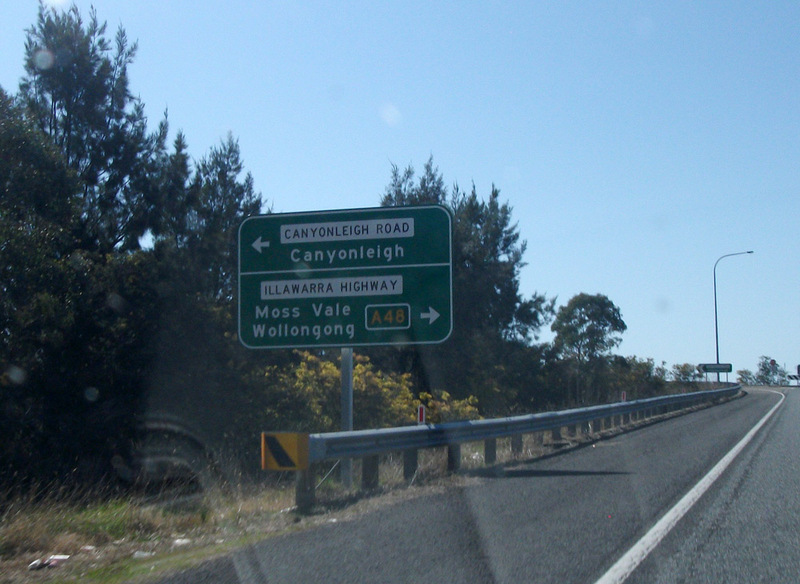 Note the contrast between the badly faded tourist drive signs and the brand new A48 sign. 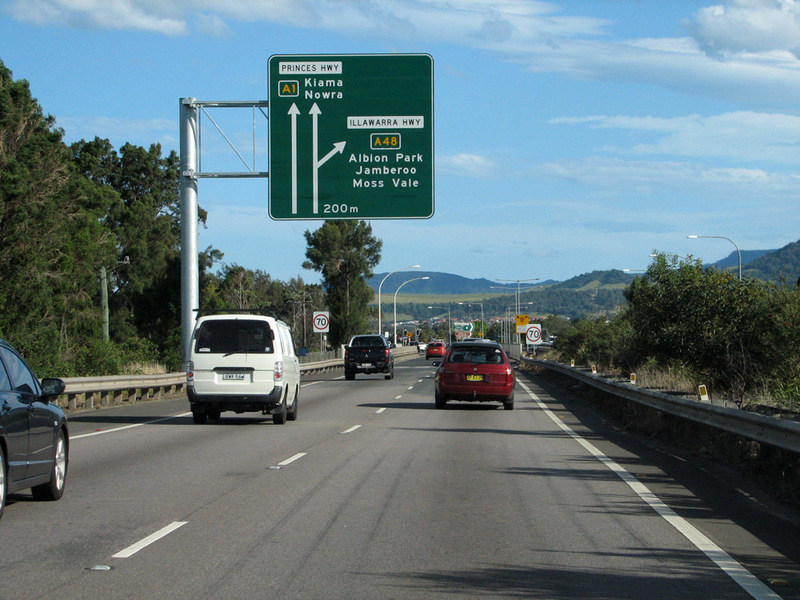 AD sign southbound on Caalong Street approaching Illawarra Highway, Robertson. Note there's 4 route markers on that sign and not one of them is State Route 80! 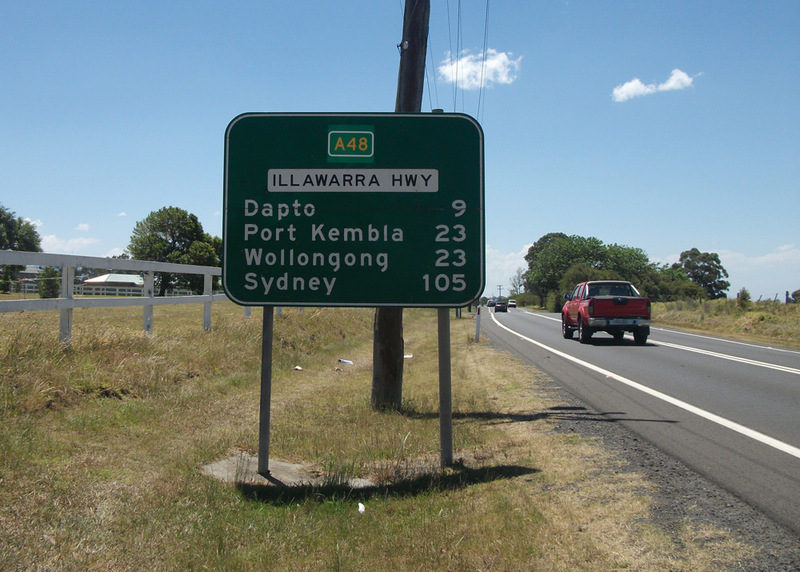 AD sign eastbound on Illawarra Highway approaching the junction with Caalong Street, Robertson. 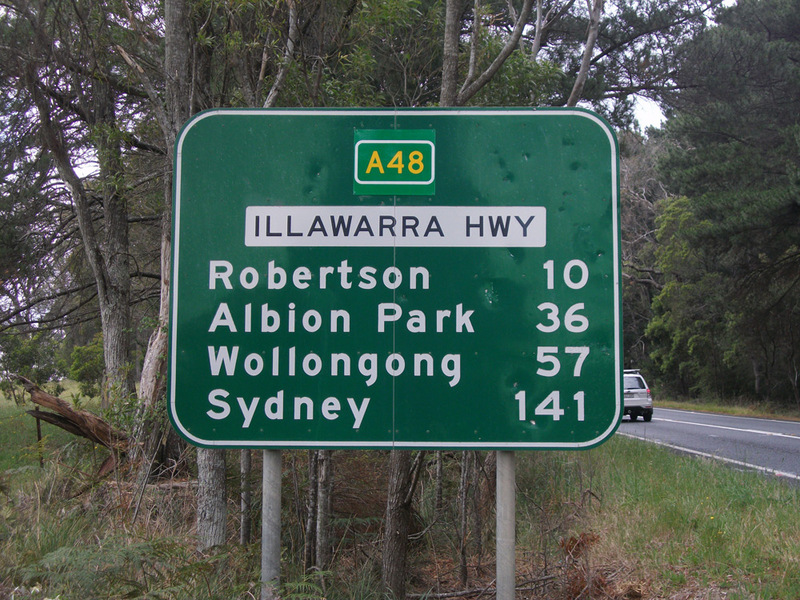 RD sign eastbound on Illawarra Highway after the junction with Pearsons Lane, 3km west of Robertson. 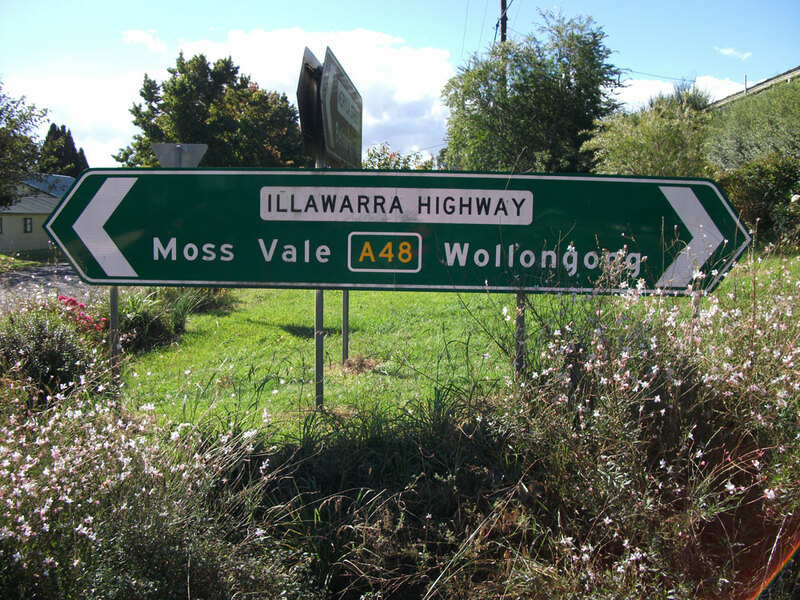 A48 topknots and blank coverplate covering NR48 - intersection of Illawarra Highway & Persons Lane, 3km west of Robertson. 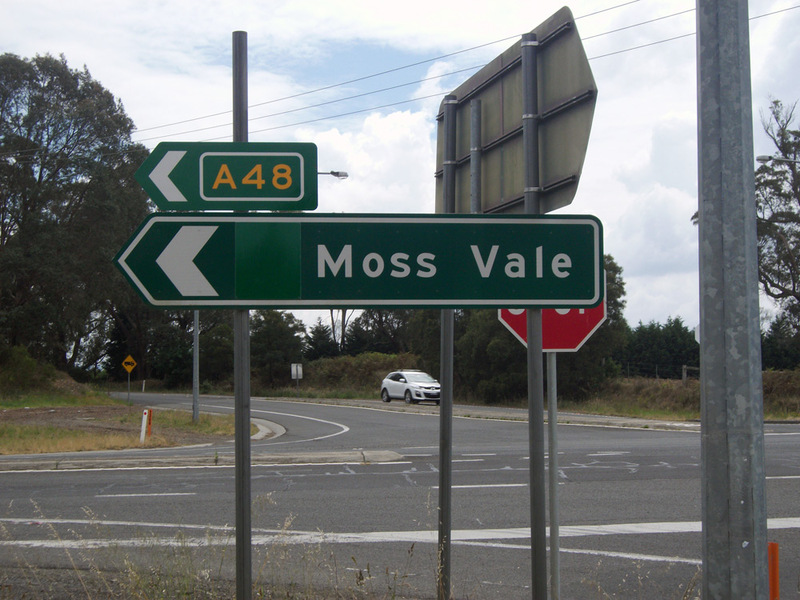 Prematurely exposed A48 route marker on an RD sign, westbound on Illawarra Highway after the junction with Pearsons Lane, 3km west of Robertson. 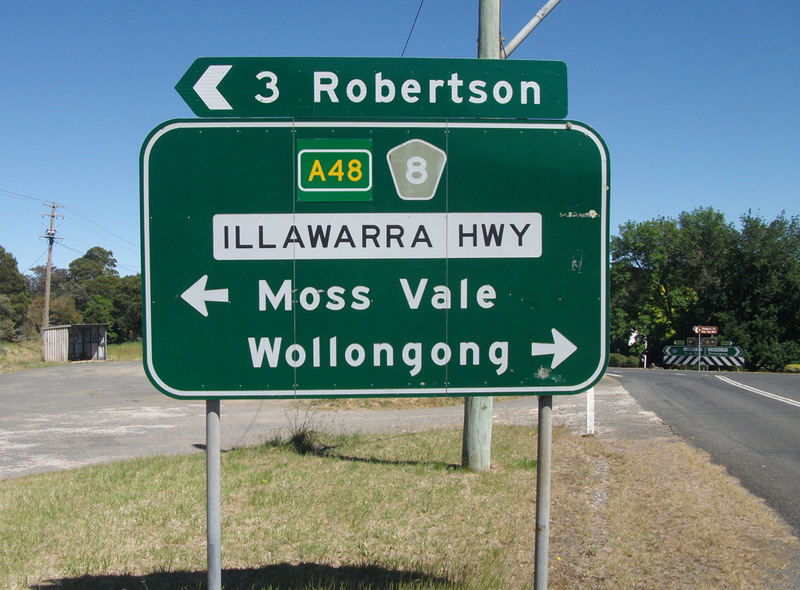 RD sign eastbound on Illawarra Highway after the junction with McGraths Road, 6km west of Robertson. 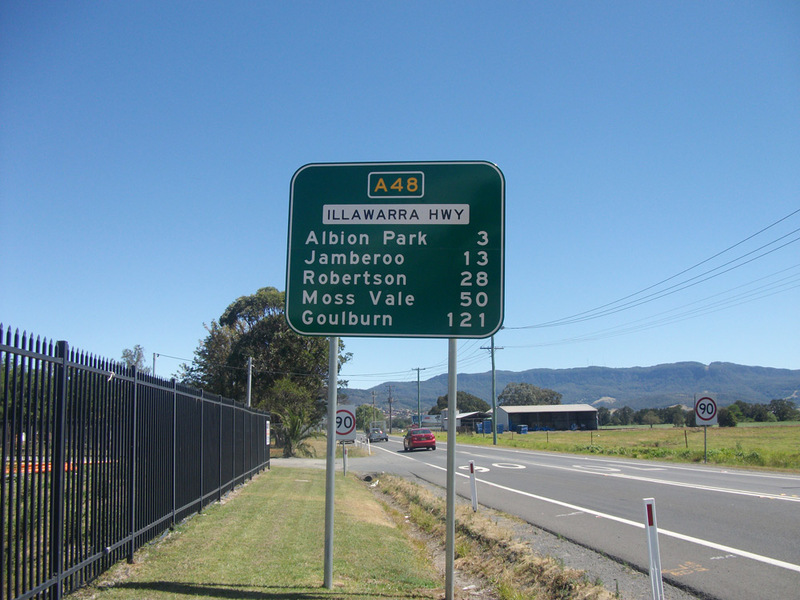 Unusual placement of the A48 supplementary plate at the intersection of Illawarra Highway & McGraths Road, 6km west of Robertson. 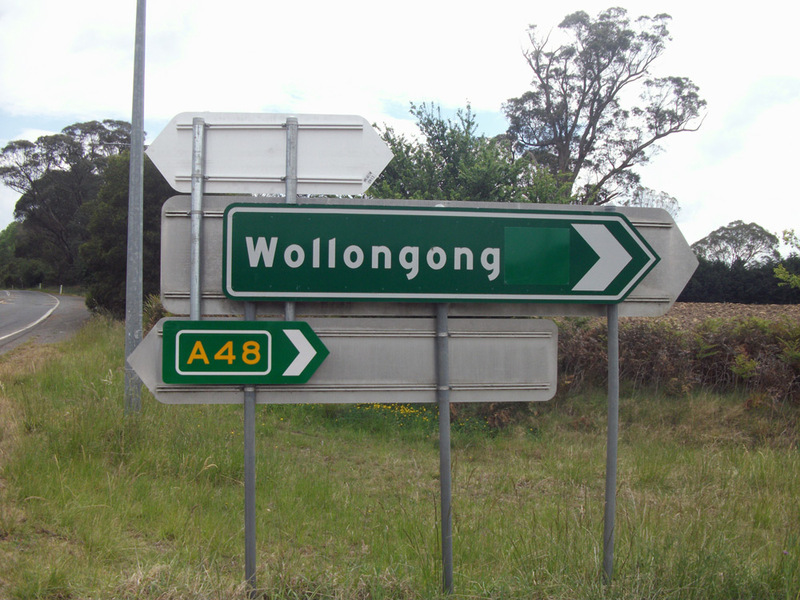 Note the discrepency in distances to Wollongong between this sign and the previous sign. 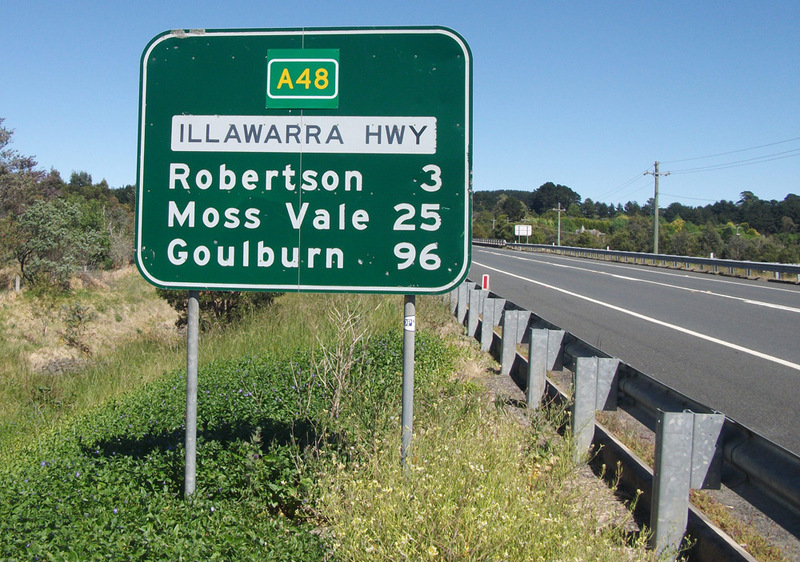 RD sign westbound on Illawarra Highway after the junction with McGraths Road, 6km west of Robertson. 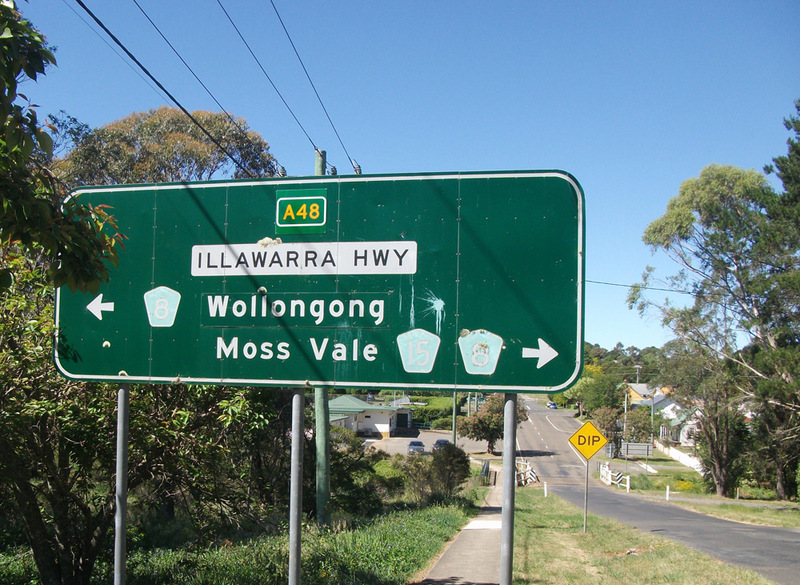 RD sign eastbound on Illawarra Highway after the junction with Church Street, Burrawang. 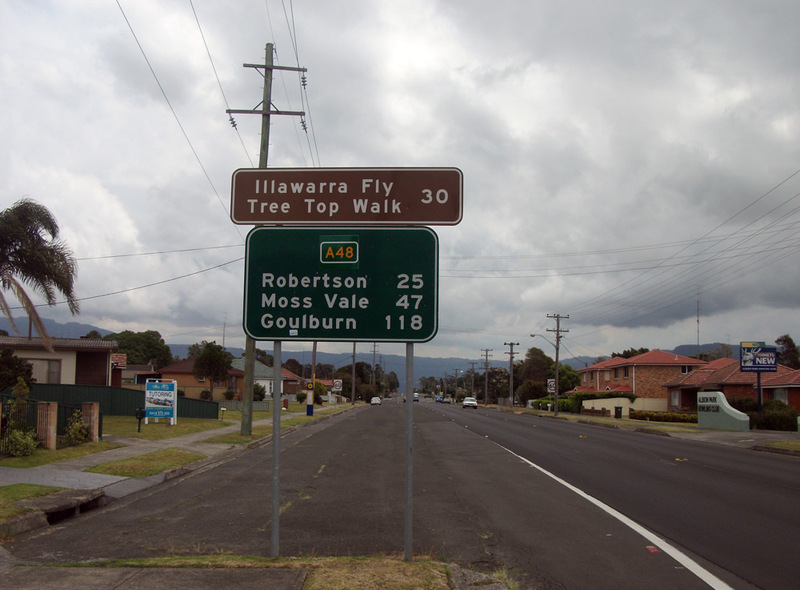 Fingerboard sign assembly at the junction of Illawarra Highway & Church Street, Burrawang. 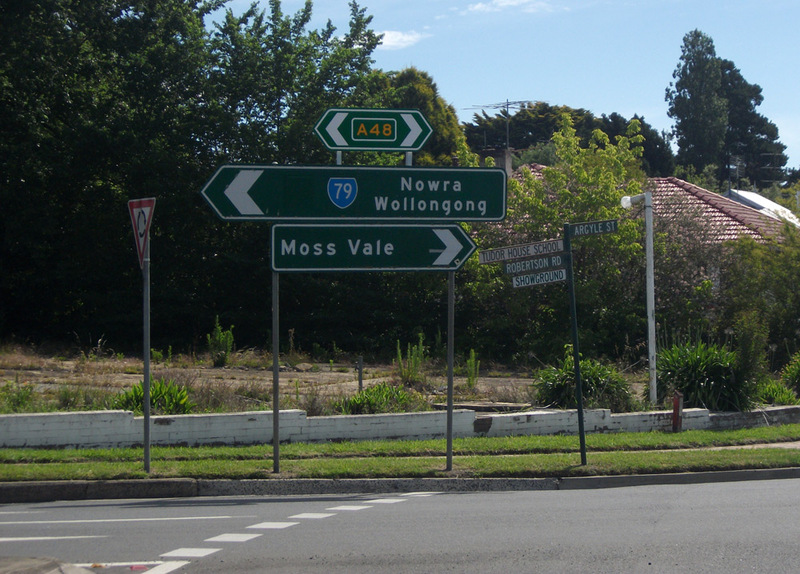 Prematurely uncovered RD sign westbound on Illawarra Highway after the junction with Church Street, Burrawang. Source: Rick Wardle, April 2007. 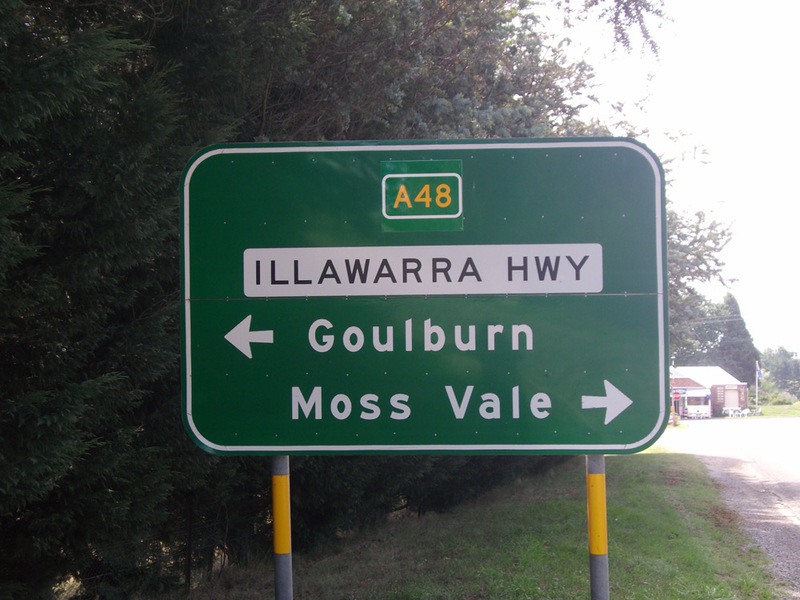 Coverplated RD sign eastbound on Illawarra Highway after the junction with Sheepwash Road, Calwalla. Source: Dean Pryke, November 2013. 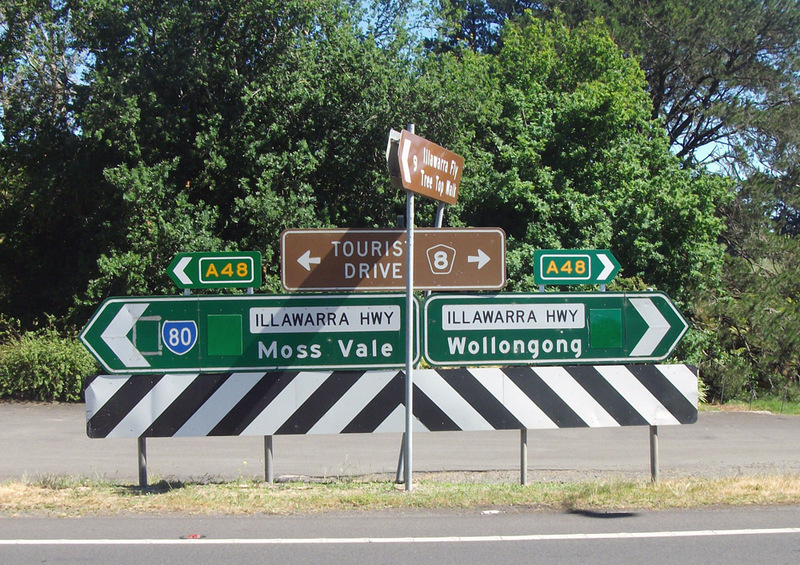 AD sign westbound on Illawarra Highway approaching the junction with Sheepwash Road, showing the full assortment of alpha-numeric sign modifications - two variations of topknot and a coverplate. 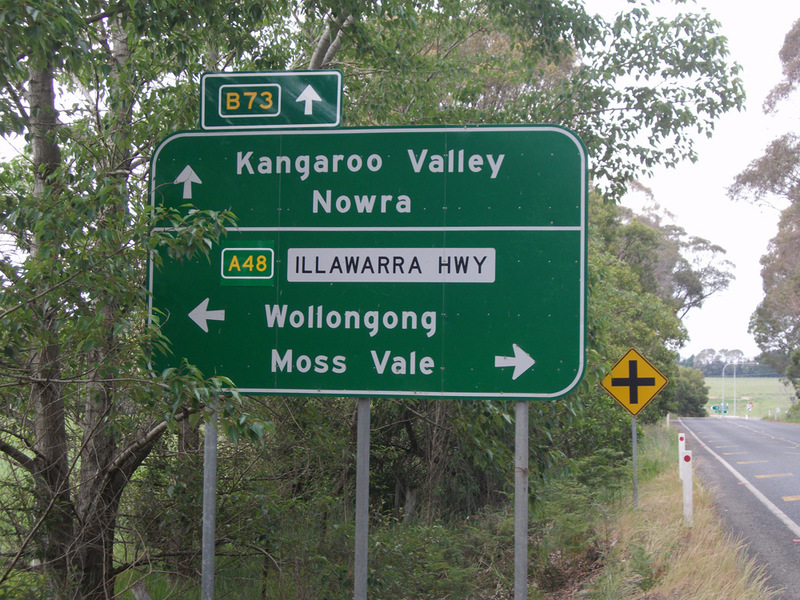 AD sign northbound on Sheepwash Road approaching the junction with Illawarra Highway, Calwalla. 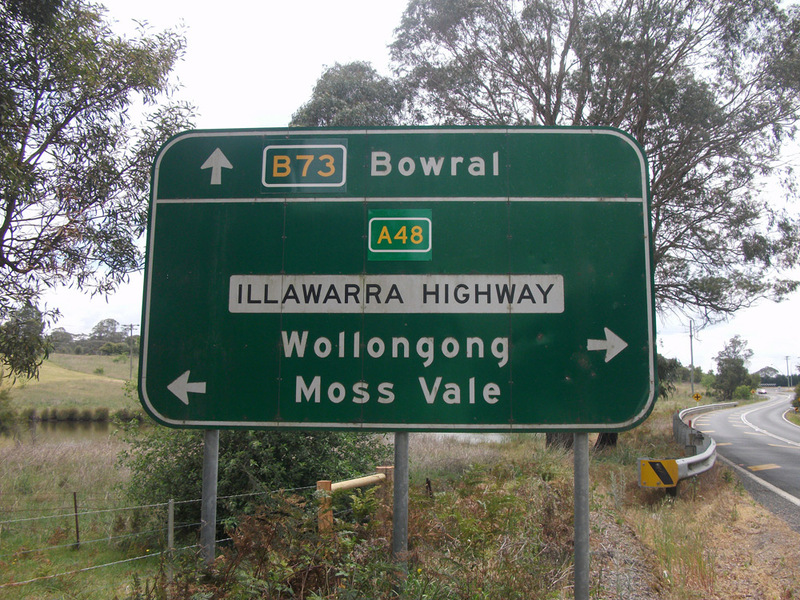 AD sign southbound on Sheepwash Road approaching the junction with Illawarra Highway, Calwalla. 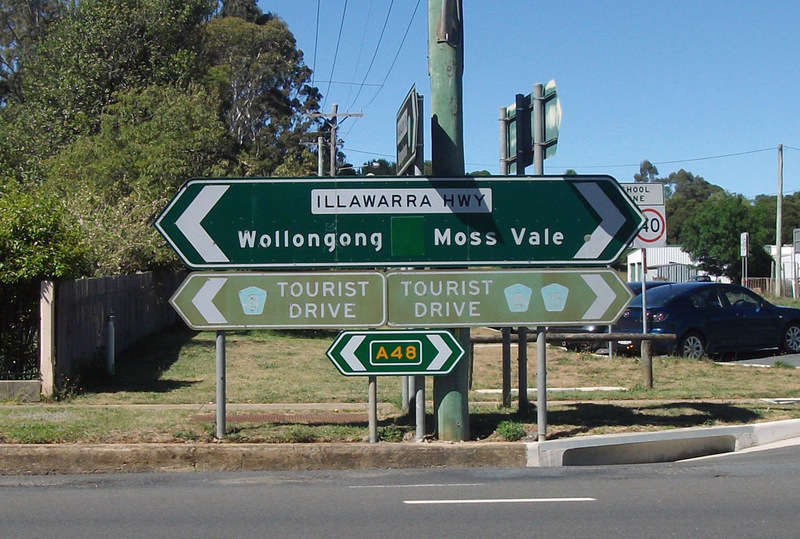 Assortment of Intersection Direction signs at the junction of Illawarra Highway & Sheepwash Road, Calwalla. 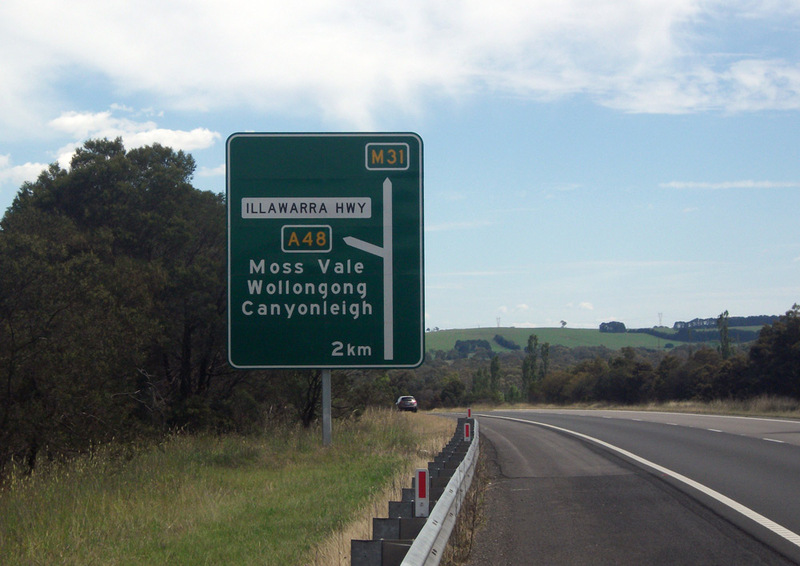 AD sign eastbound on Illawarra Highway approaching the junction with Sheepwash Road, showing the full assortment of alpha-numeric sign modifications - two variations of topknot and a coverplate. 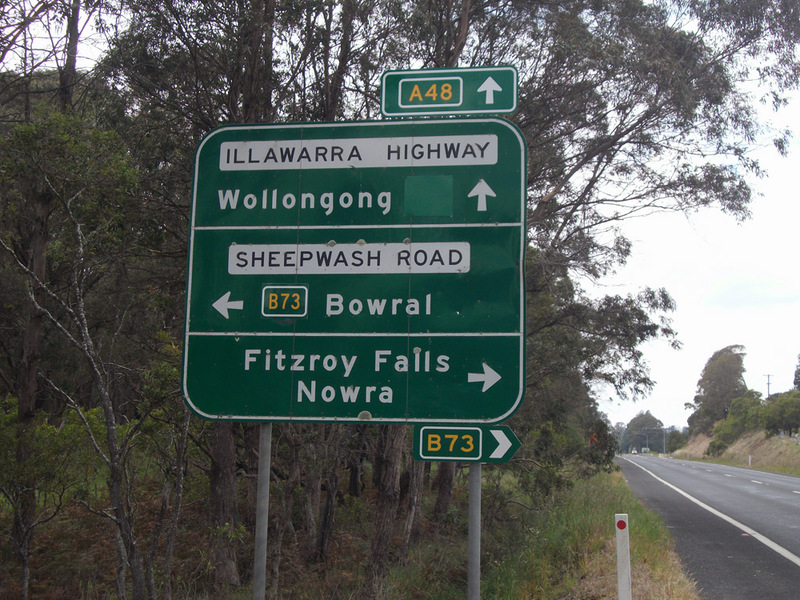 RD sign westbound on Illawarra Highway after the junction with Sheepwash Road, Calwalla. 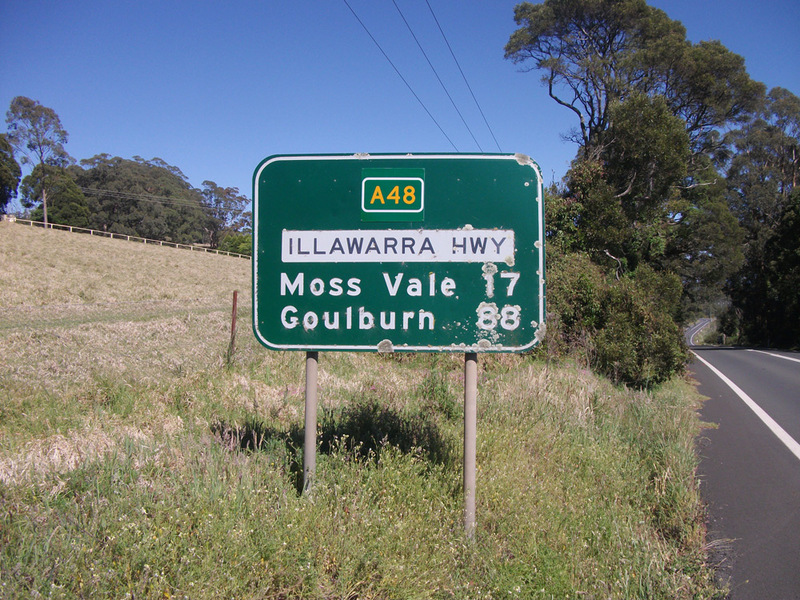 Coverplated AD sign eastbound on Illawarra Highway approaching the junction with Nowra Road, 5km east of Moss Vale. The two coverplates cover NR48 and SR79; it's not clear why RMS didn't just place a single A48 coverplate over the top of both. 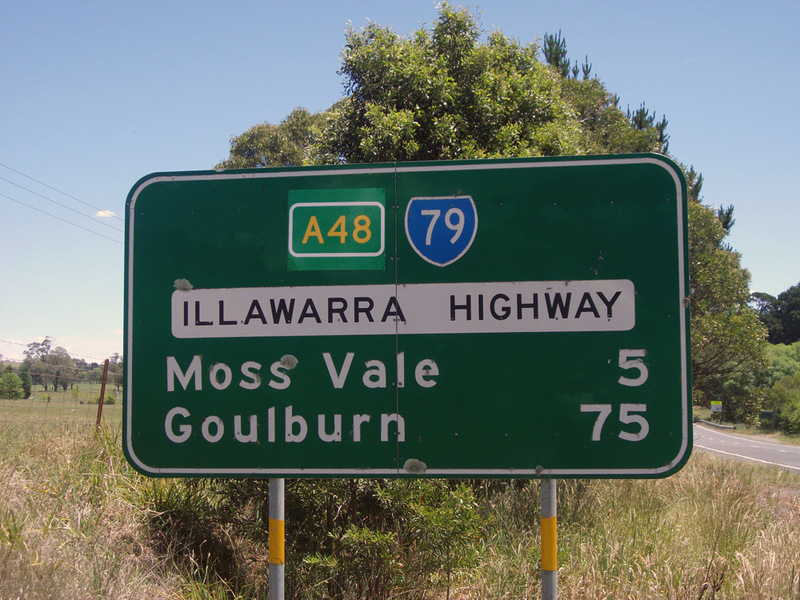 Coverplated AD sign northbound on Nowra Road approaching the junction with Illawarra Highway, 5km east of Moss Vale. 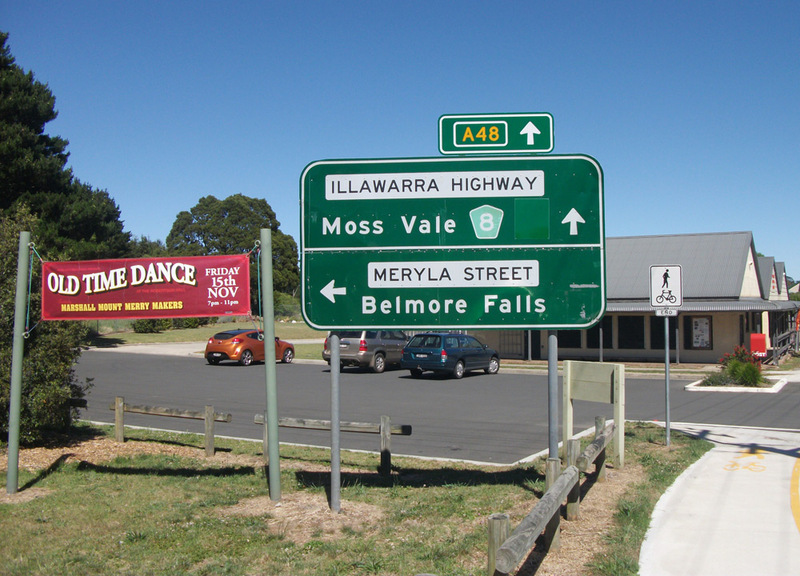 Dodgy fingerboard and ID sign assembly at the junction of Illawarra Highway & Nowra Road, 5km east of Moss Vale. 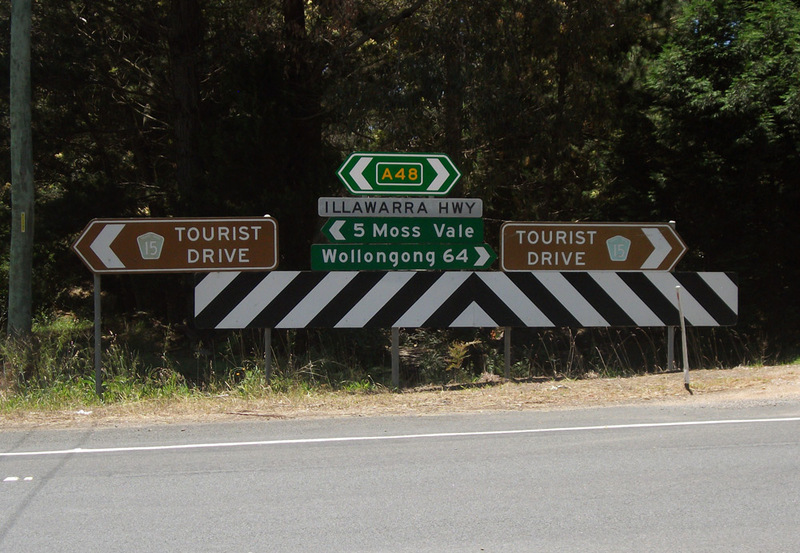 Note that the right-pointing Tourist Drive 15 ID sign is wrong - it should of course be pointing down Nowra Road. 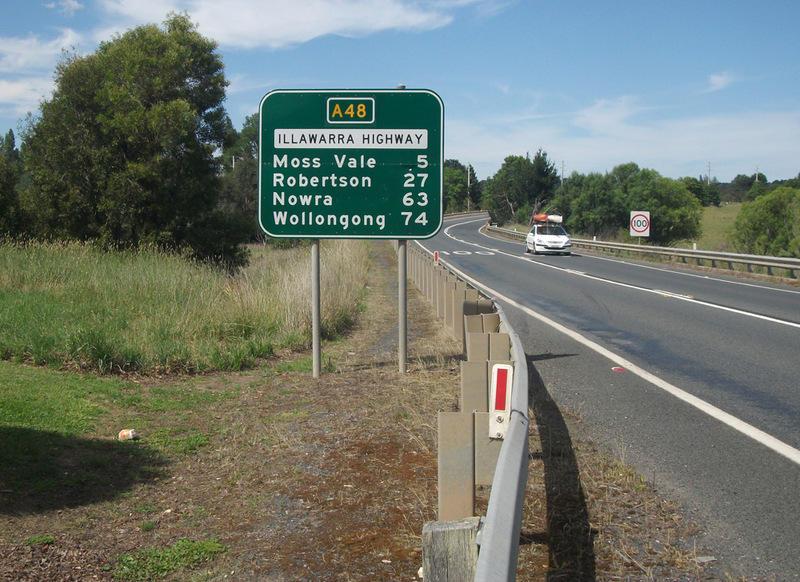 Coverplated AD sign eastbound on Illawarra Highway approaching the junction with Nowra Road, 5km east of Moss Vale. 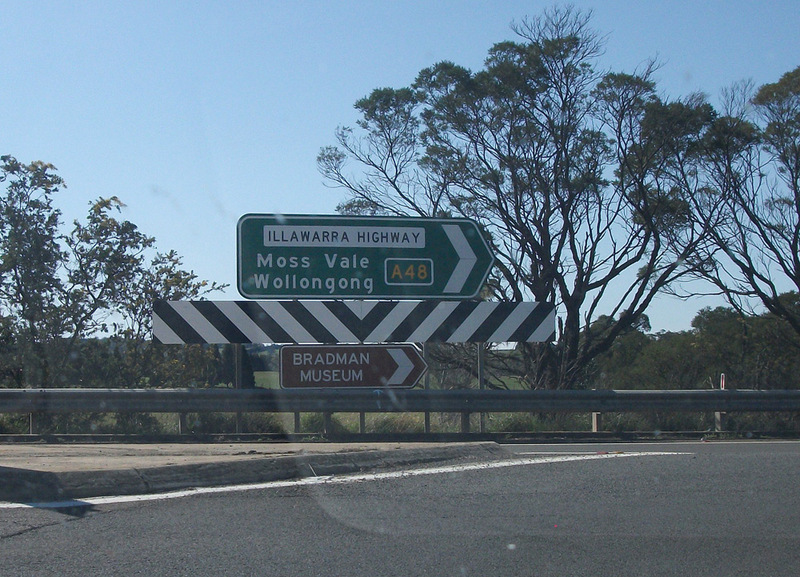 Coverplated RD sign westbound on Illawarra Highway after the junction with Nowra Road, 5km east of Moss Vale. Note the remnant SR79 shield which has apparently since been coverplated (as at January 2014). 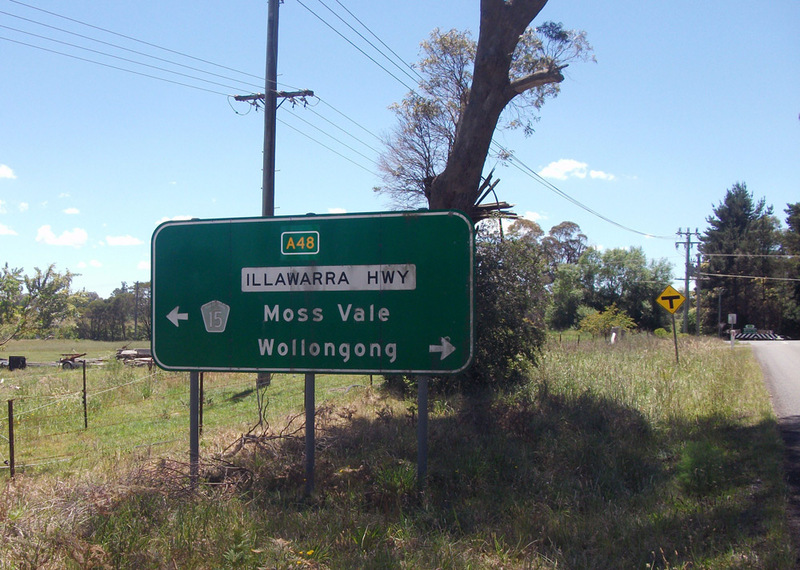 RD sign eastbound on Illawarra Highway approximately 4km east of Moss Vale (the junction with Nowra Road is just out of view at the top of the hill in the background). 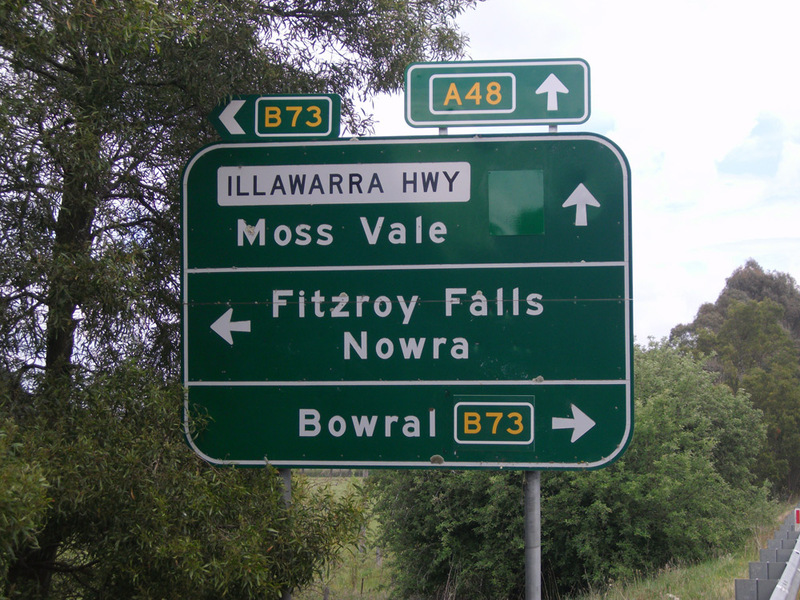 Note that Nowra has been incorrectly omitted from this sign, despite being shown on signs in Moss Vale - I get the feeling this sign is in the wrong spot and should be after the junction with Nowra Road. 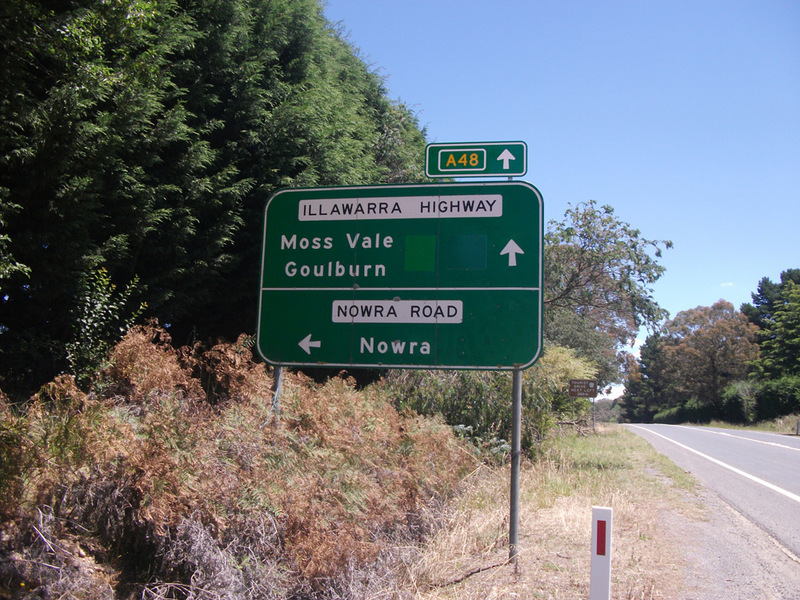 RD sign eastbound on Illawarra Highway after the junction with Suttor Road, Moss Vale. Note the remnant SR79 shield which I believe has since been coverplated (as at January 2014). Source: Dean Pryke, December 2013. 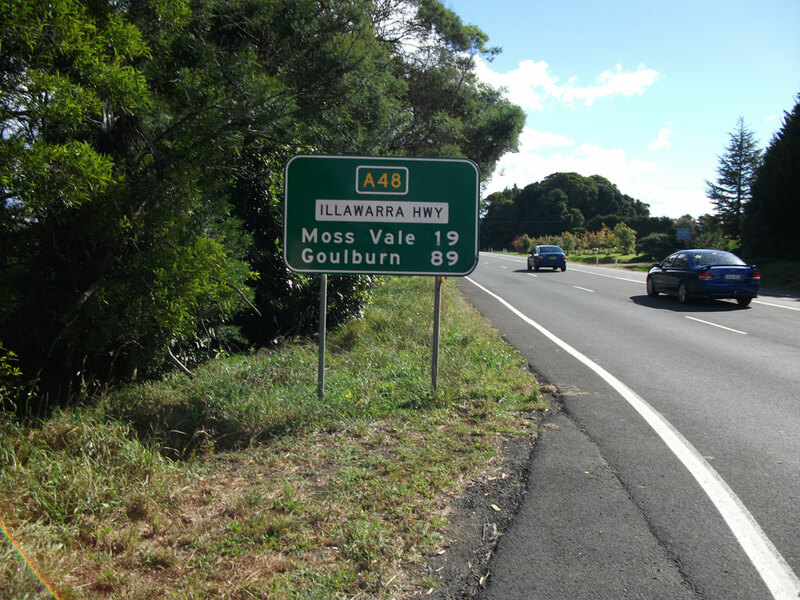 AD sign westbound on Illawarra Highway approaching the junction with Argyle Street & Suttor Road, Moss Vale. Note the coverplated SR79 shield. 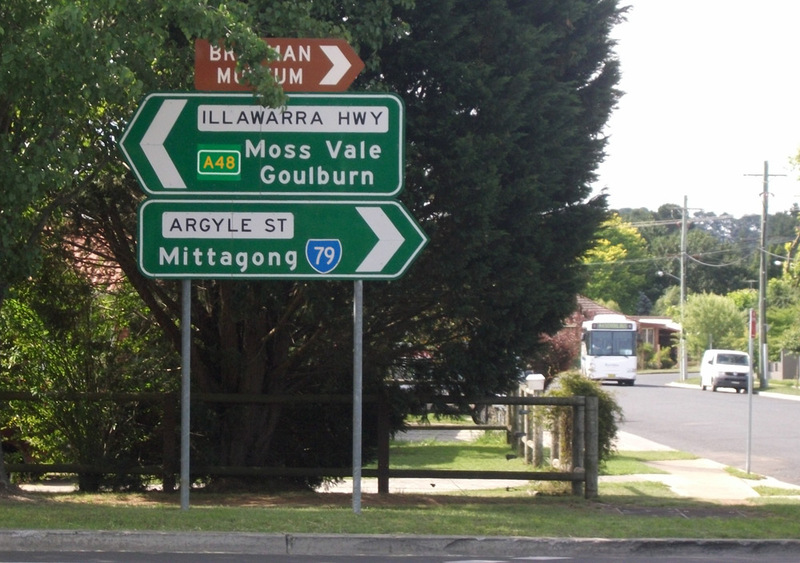 AD sign southbound on Argyle Street approaching the junction with Illawarra Highway & Suttor Road, Moss Vale. Note the remnant SR79 shield which I believe has since been coverplated (as at January 2014). 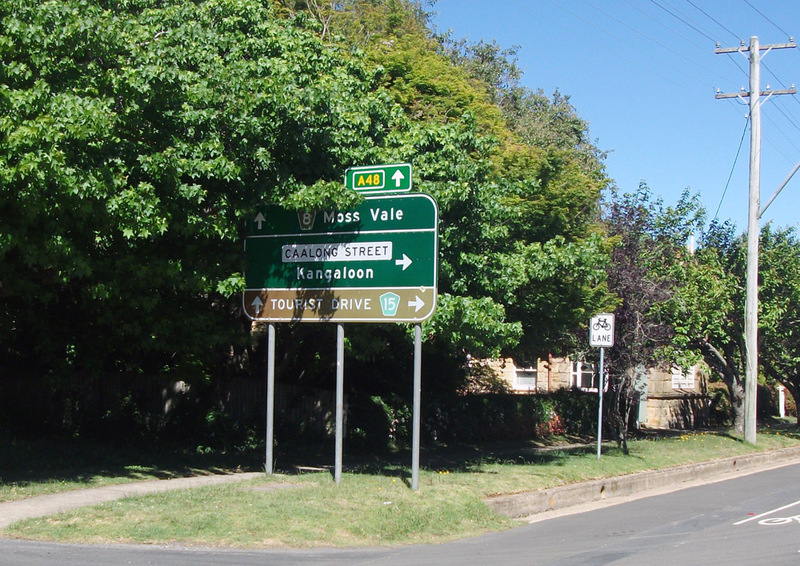 ID sign assemblies at the junction of Illawarra Highway, Argyle Street & Suttor Road, Moss Vale. 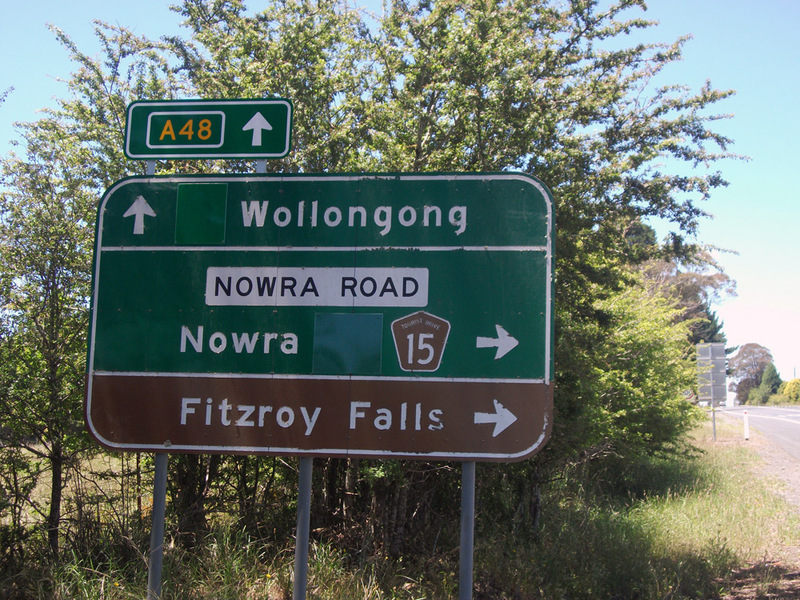 Note the remnant SR79 shields which I believe have since been removed (as at January 2014) and the inclusion of Nowra which was of course omitted from the RD sign near Nowra Road. 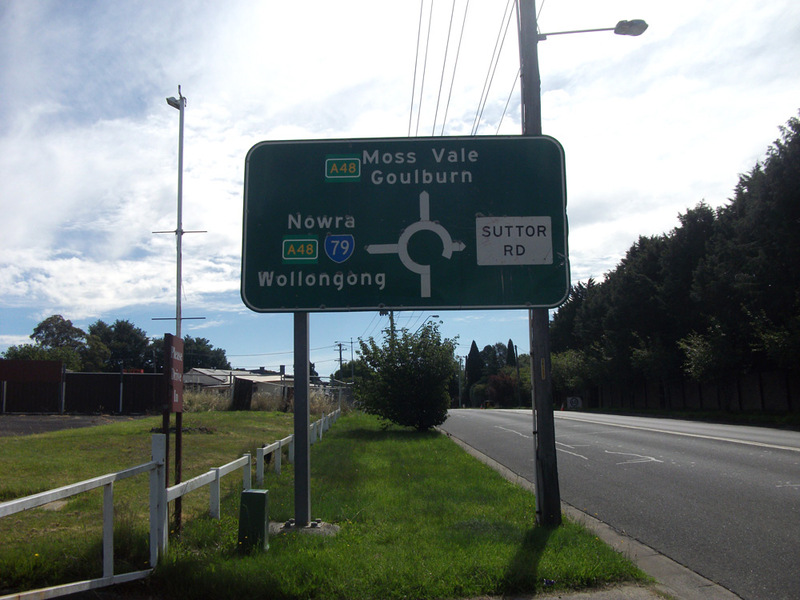 AD sign northbound on Illawarra Highway (Argyle Street) approaching the junction with Suttor Road, Moss Vale. Note the remnant SR79 shields which I believe have since been coverplated (as at January 2014). 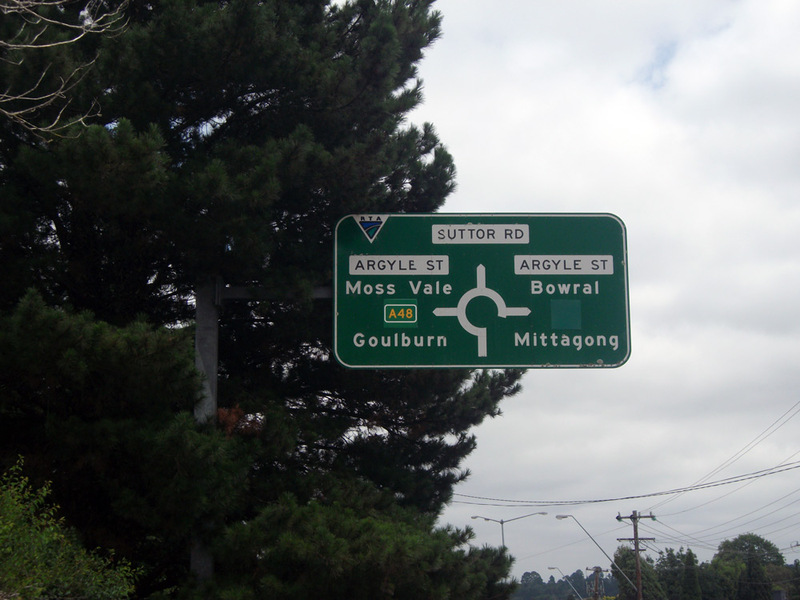 Coverplated RD sign westbound on Illawarra Highway (Argyle Street) after the junction with Suttor Road, Moss Vale. 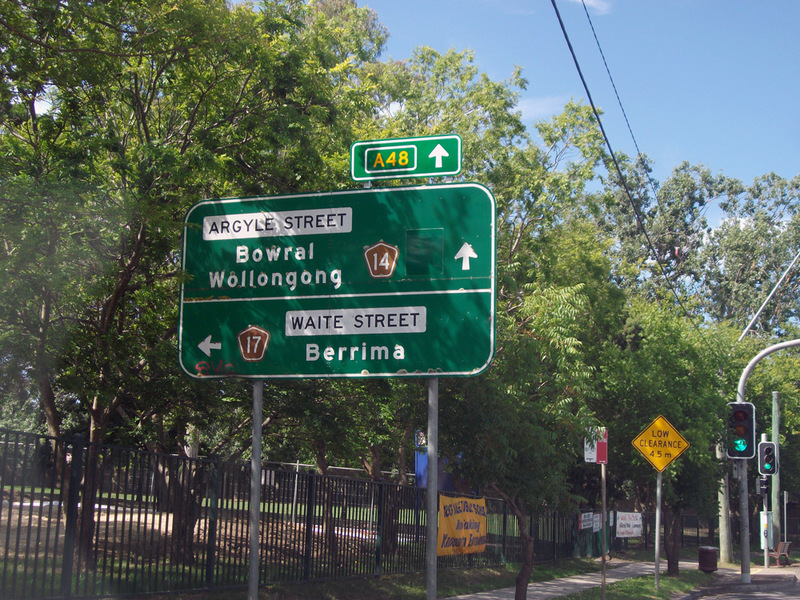 AD sign westbound on Illawarra Highway (Argyle Street) approaching Waite Street, Moss Vale. Note the appearance of TD14, which isn't seen again until Old Argyle Road. 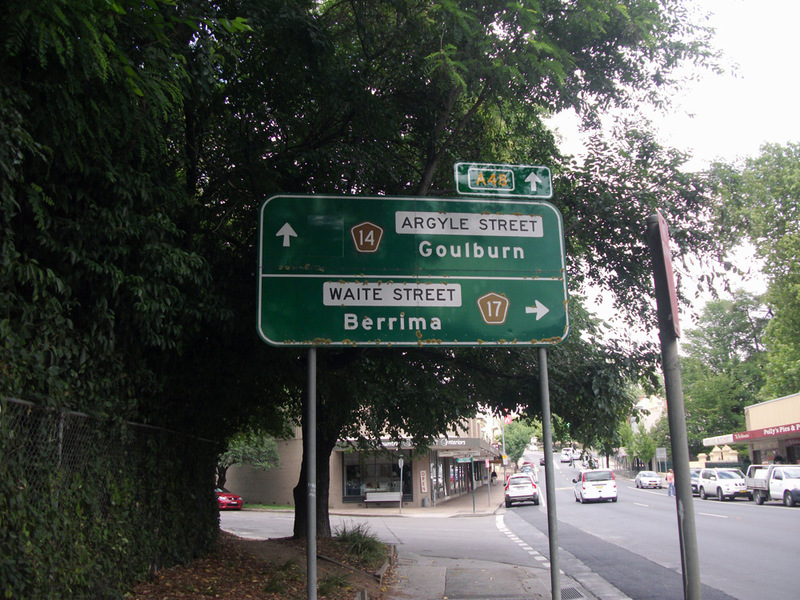 Coverplated AD sign southbound on Waite Street approaching the junction with Illawarra Highway (Argyle Street), Moss Vale. Note the missing A48 route marker - this has since been fixed. 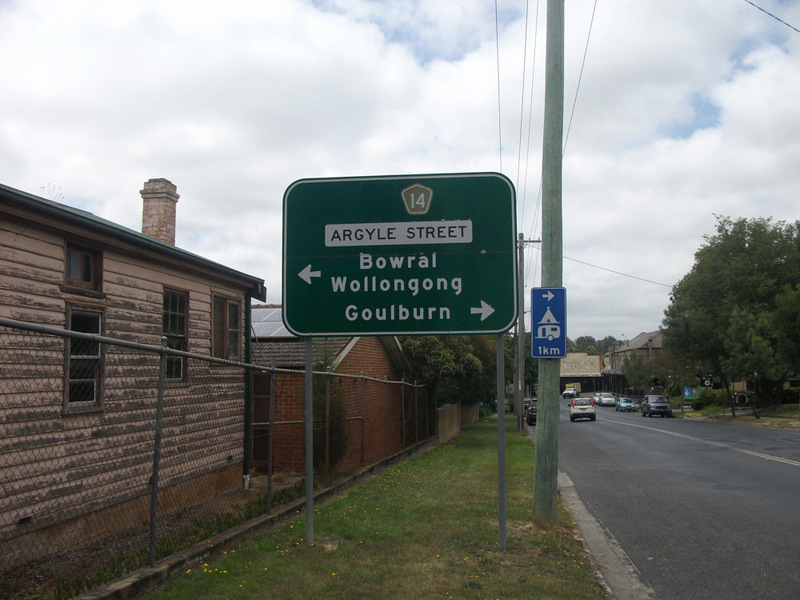 Coverplated AD sign eastbound on Illawarra Highway (Argyle Street) approaching the junction with Waite Street, Moss Vale. 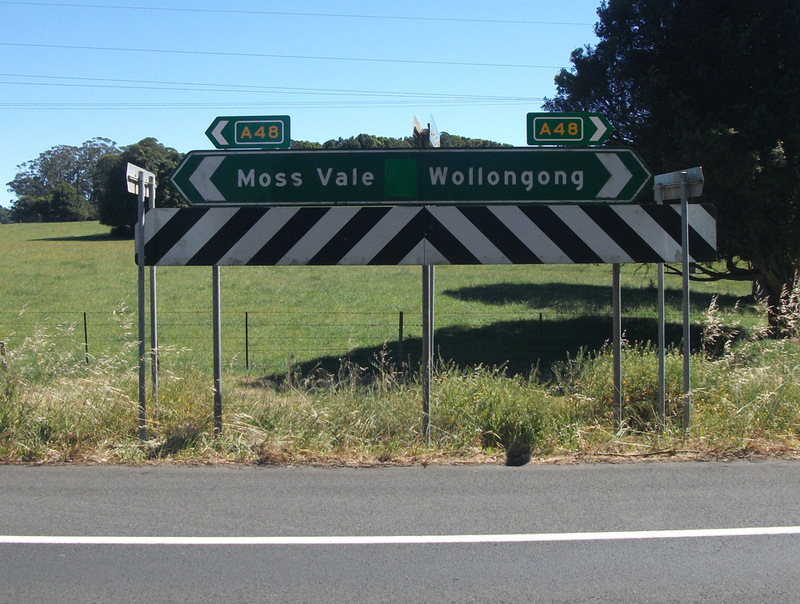 ID sign assembly at the junction of Illawarra Highway & Oldbury Road, 3km west of Moss Vale. Prematurely exposed A48 route marker on an RD sign, eastbound at Sutton Forest. 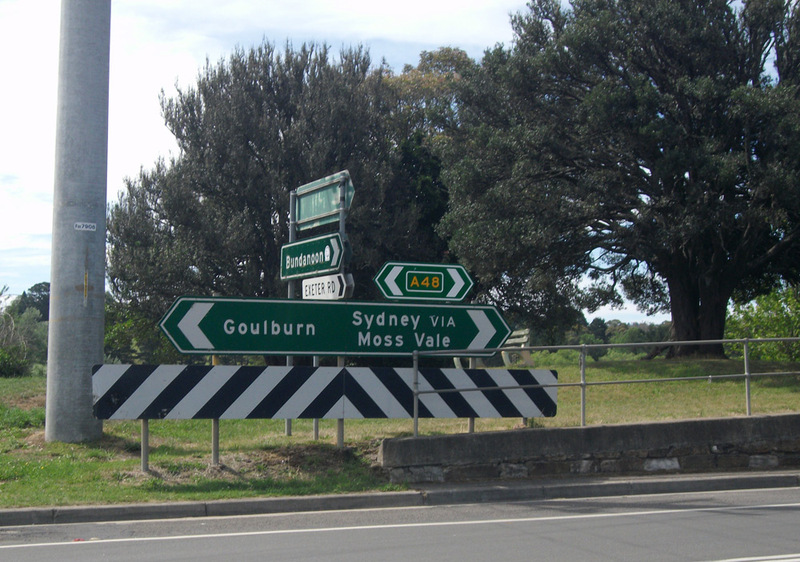 Coverplated ID sign assembly at the junction of Illawarra Highway & Golden Vale Road, Sutton Forest. 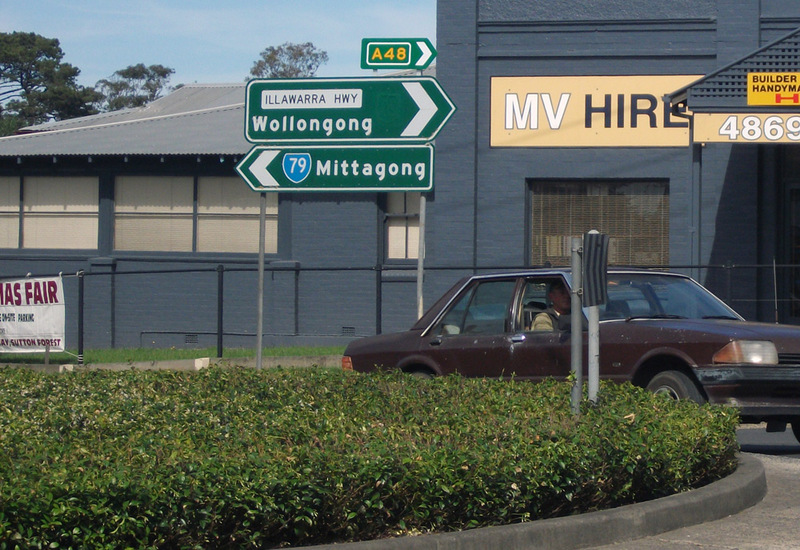 Dodgy ID sign assembly at the junction of Illawarra Highway & Exeter Road, Sutton Forest. 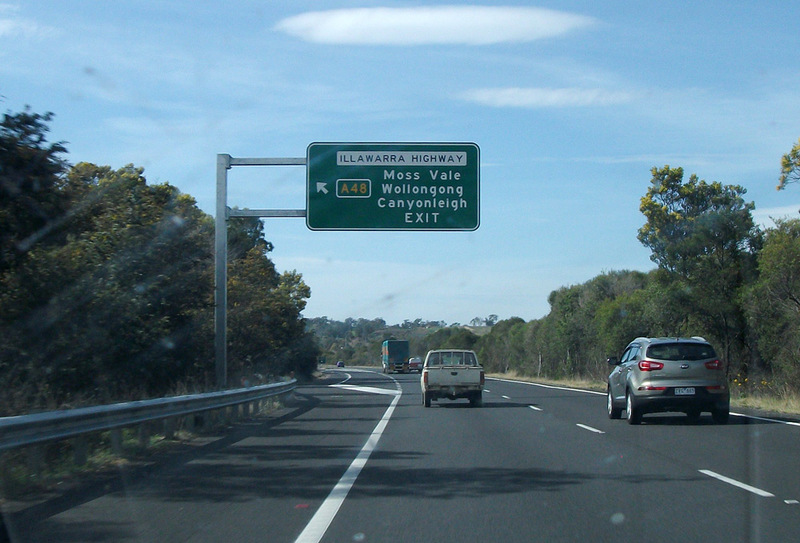 Coverplated AD sign westbound on Illawarra Highway approaching the junction with Exeter Road, Sutton Forest. Note the TD16 shield, which was not included on any other signs at the junction. 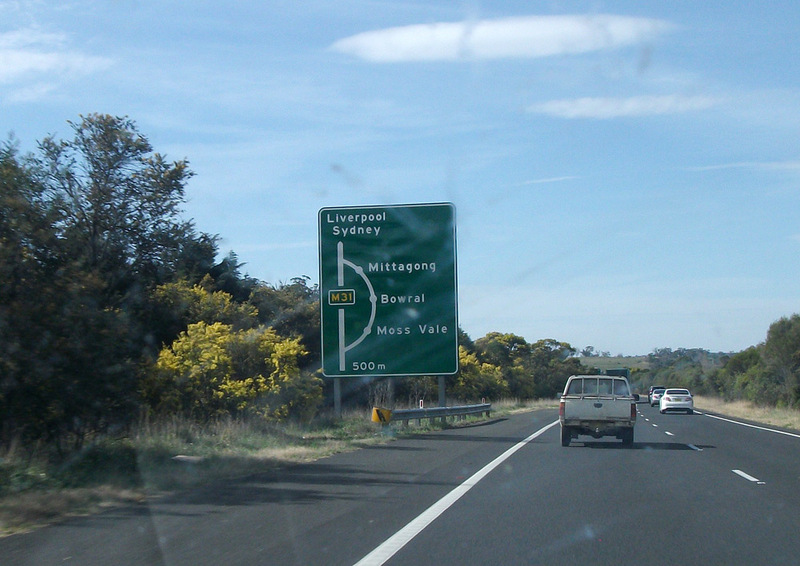 Coverplated AD sign northbound on Exeter Road approaching the junction with Illawarra Highway, Sutton Forest. 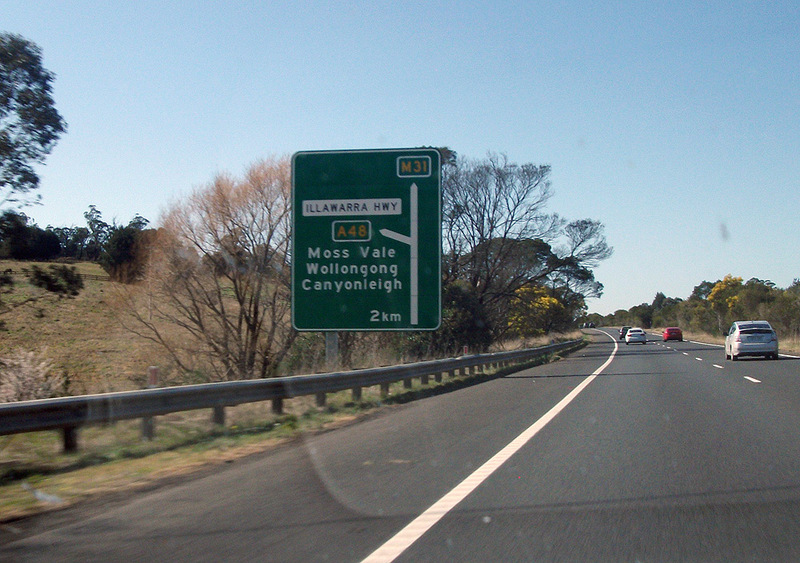 AD sign eastbound on Illawarra Highway approaching the junction with Exeter Road, Sutton Forest. 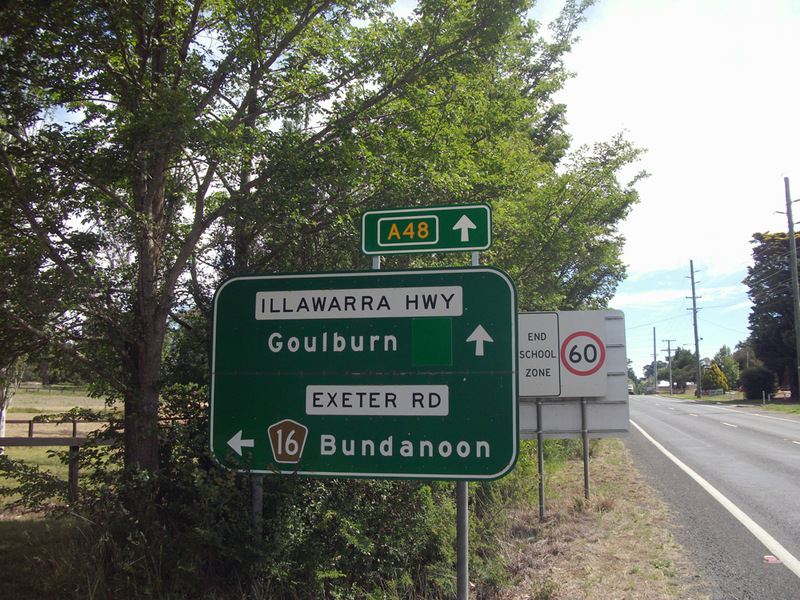 RD sign westbound on Illawarra Highway after the junction with Exeter Road, Sutton Forest. 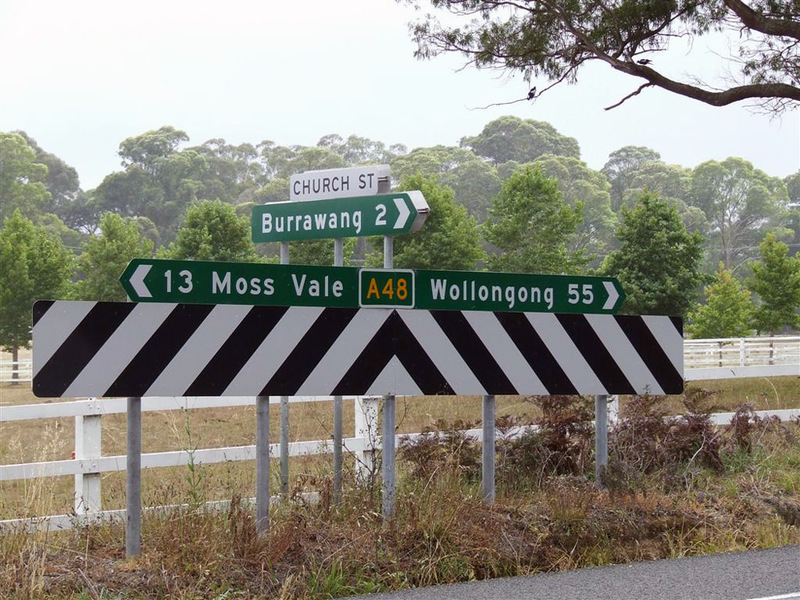 Dodgy fingerboard sign assembly at the junction of Illawarra Highway & Old Argyle Road, 3km east of Hoddles Cross Roads. 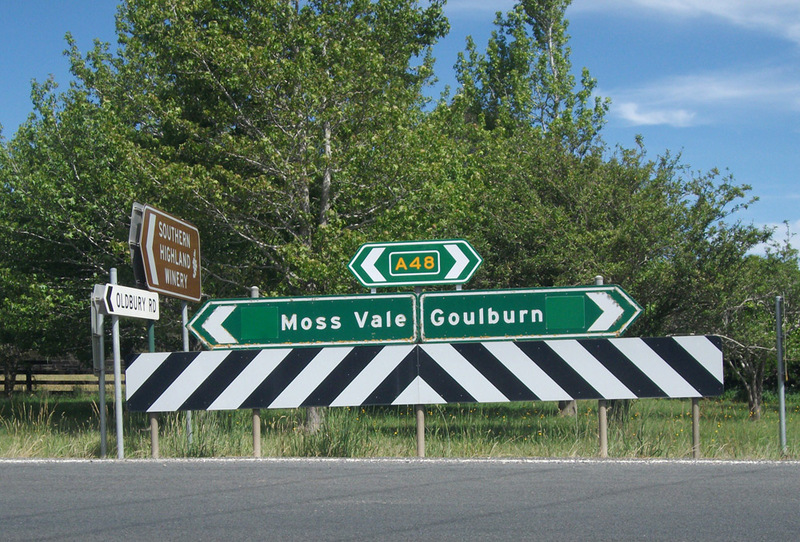 Note the Tourist Drive 14 sign - this route was not mentioned on any signs at Hoddles Cross Roads. 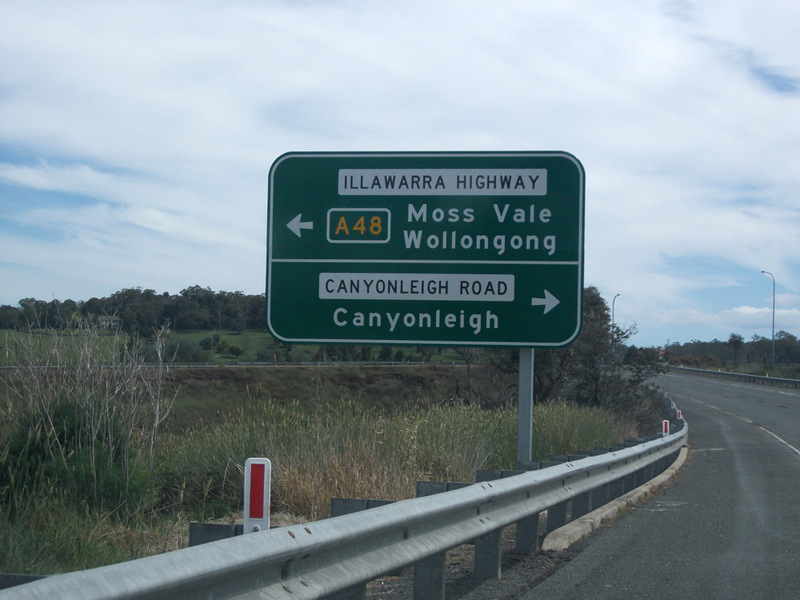 RD sign eastbound on Illawarra Highaay after the junction with Hume Highway & Canyonleigh Road at Hoddles Cross Roads. 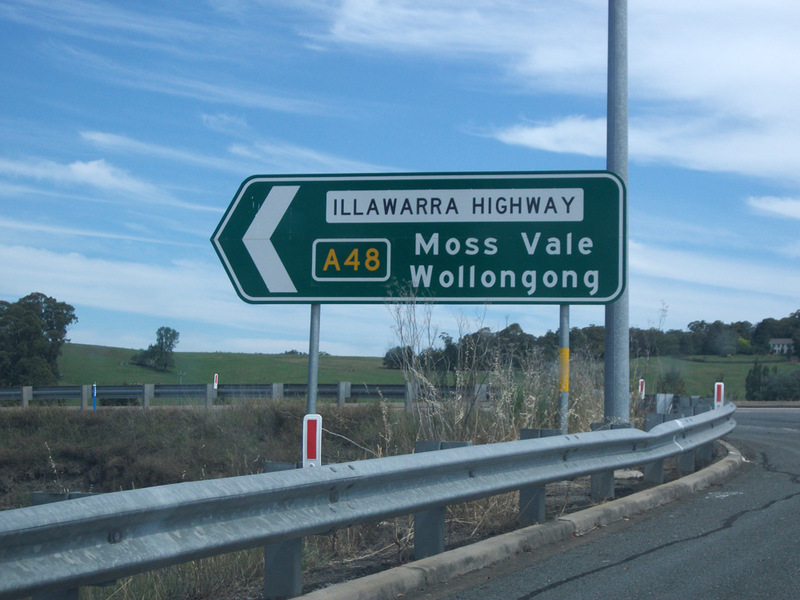 Signage for southbound traffic on Hume Highway approaching the junction with Illawarra Highway at Hoddles Cross Roads. Top photo: Dean Pryke, December 2013. 2nd & 3rd photos: Dean Pryke, August 2013. 4th & bottom photos: Dean Pryke, December 2013. 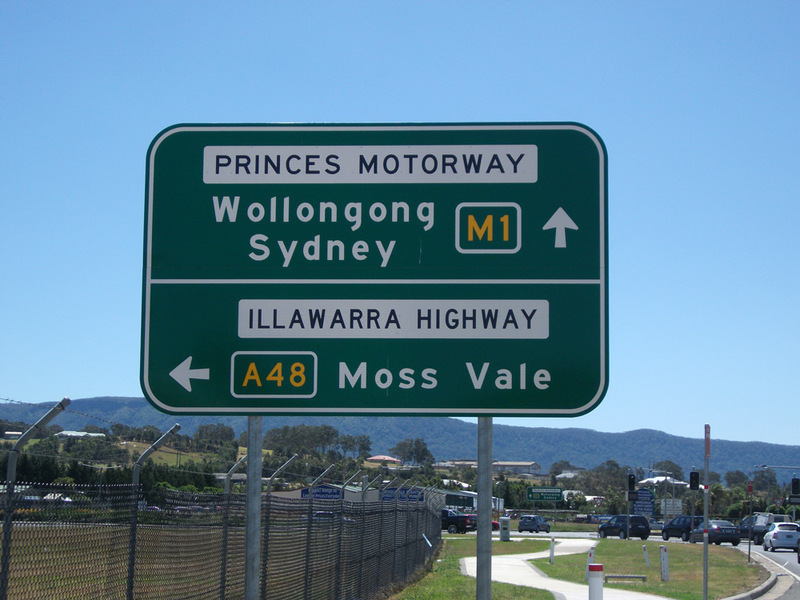 Signage for northbound traffic on Hume Highway approaching the junction with Illawarra Highway at Hoddles Cross Roads, and continuing on the off-ramp. Source: Dean Pryke, August & September 2013. 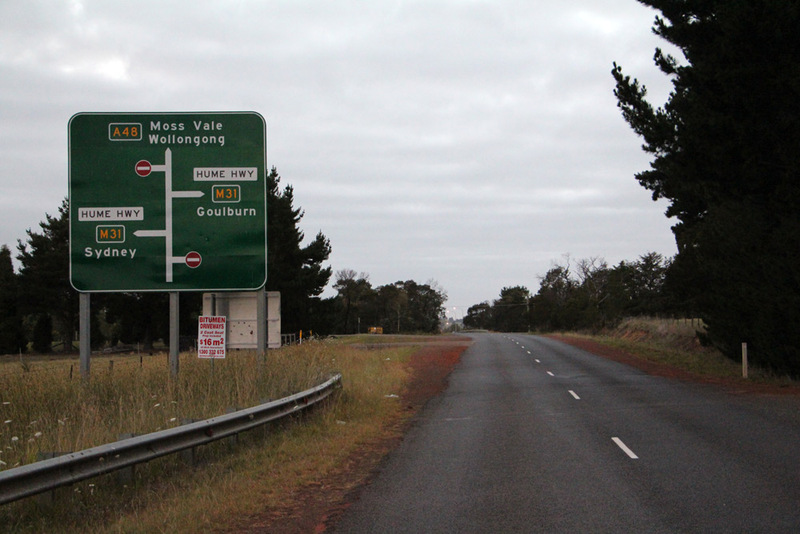 AD sign eastbound on Canyonleigh Road approaching the junction with Hume Highway & Illawarra Highway at Hoddles Cross Roads.